CSA 11, 10¢ blue used with Army of Northern Virginia target cancel on soldier’s cover to Miss M. L. Trimmier, Spartanburg, So. Ca. with endorsement of Frank Trimmier, Co., I., 13th S.C.V. (South Carolina Volunteers), Ex Northcutt. $200. Captain Francis (Frank) Marion Trimmer (1837-1883) was a graduate of the Citadel but a businessman in the printing trade before the war. He was wounded three times during the conflict. Post-war, he owned and operated the Carolina Spartan newspaper and was Clerk of the Court of the Spartanburg District until his death. 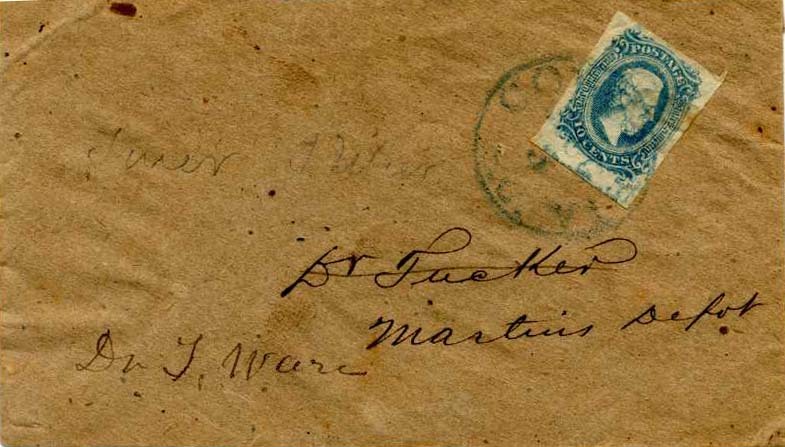 CSA 11, 10¢ blue (4 large margins) tied by neat blue COLUMBIA / S.C. cds on homemade cover addressed to Dr. Tucker, Martin’s Depot [SC – present day Joanna]. “Dr Tucker” crossed out and redirected to “Dr. T. Ware”. Extremely Fine, Ex Cantey and Northcutt. $150. 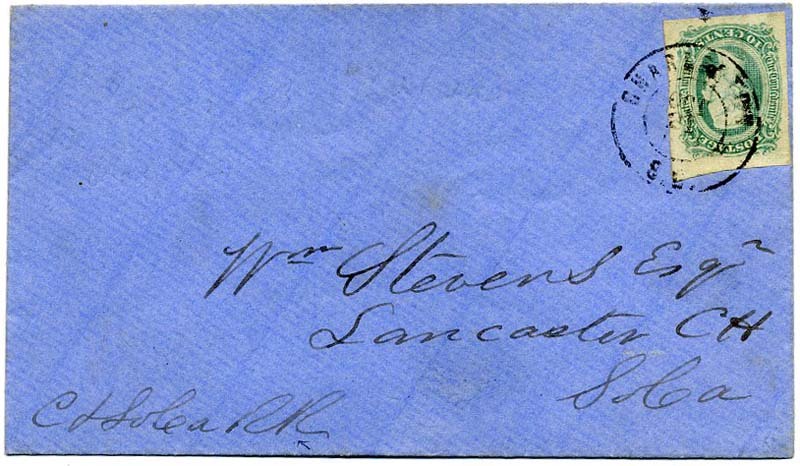 CSA 11, 10¢ blue (4 nice margins including left sheet margin) tied by neat CHARLESTON / S.C. // JUL / 31 / 1863 double circle cover on blue cover addressed to Capt. B. Manning, Head Quarter, Cantey's Brigade, Mobile, Ala.; Ex Cantey and Northcutt. $180. Brig-General James Cantey (1818-1874) served two terms in the SC legislature and was wounded during the Mexican War where he served as an officer in the Palmetto Rifles. He served under Stonewall Jackson as a colonel early in the war. He was related to late CSA member and SC collector Ed Cantey. Brown Manning was an Aide de Camp to General Cantey and took part in Hood’s Tennessee and Atlanta campaigns. He was captured at Lynch’s Creek SC on 2-27-65. A copy of a page from his service record included. 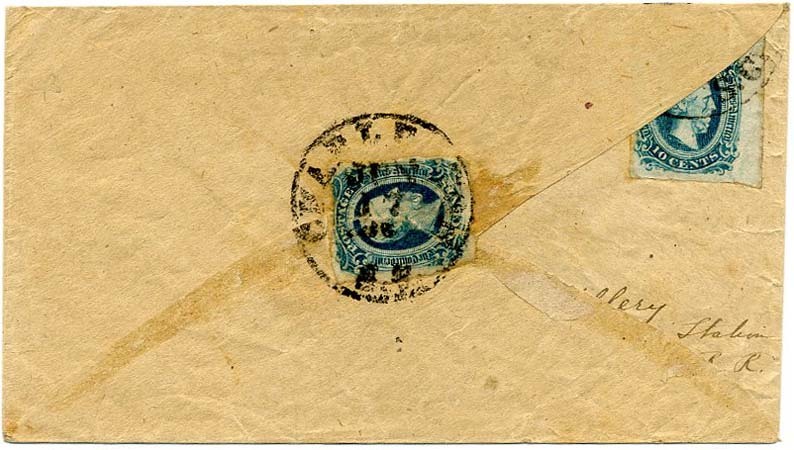 CSA 11, 10¢ blue (4 margins) tied CHARLESTON / S.C. double circle cancel used on cover from which another Georgia canceled stamp had been removed, thus a twice used adversity use. 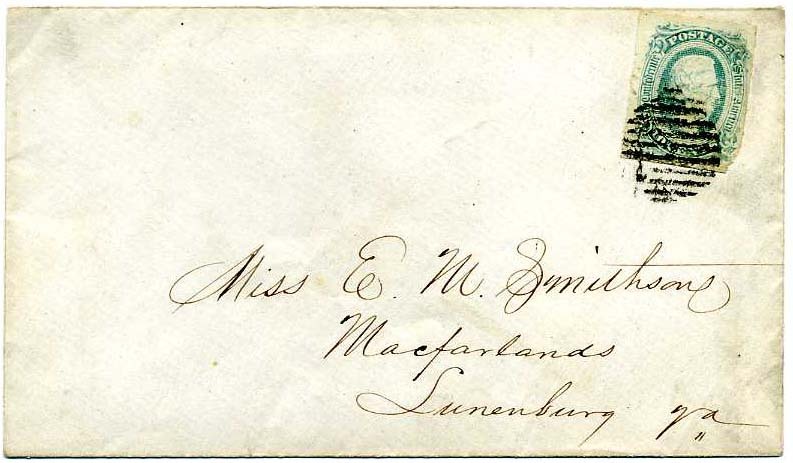 Addressed to Miss Mackay for Mrs. William H. Elliott, Savannah, Georgia and likely originated with that source. $180. CSA 11, 10¢ blue tied by neat GAINESVILLE / Ala. // SEP / 2  cds on pristine cover to C. W. Henderson, Esqr., Clerk Circuit Court of Lauderdale, Marion, Missi with “Official Business” docketing at top. 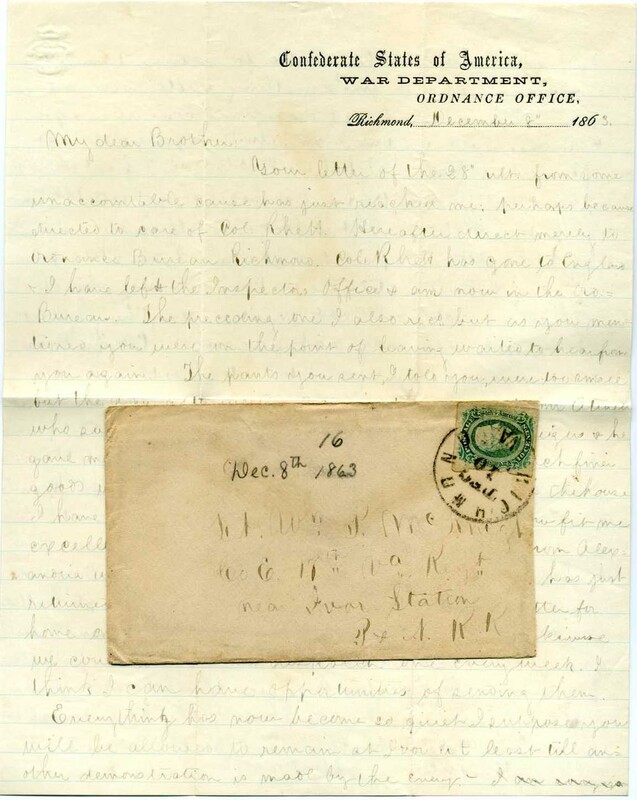 Original letter headed Gainesville, Sept 2d, 1864 signed T. Reavis asking “whether in the case of Godstein vs. Godstein was decided at he last term. If it was did the Pltf. Get a decree for a divorce and was the Deft. Prohibited from marrying again?” He also asks that another case be dismissed and that he be sent the bill of costs so he can pay it. Letter has archival tape repaired file splits. $230. 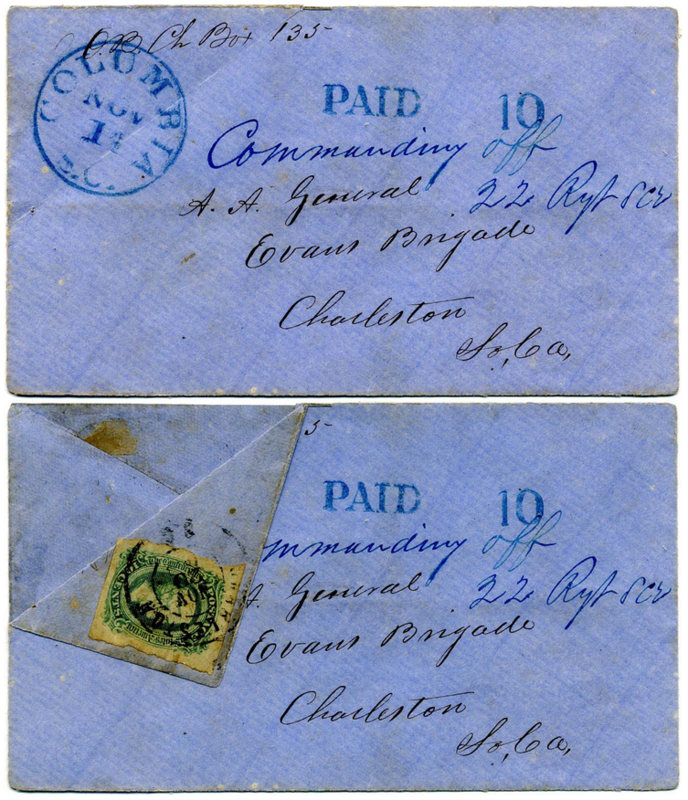 CSA 11, 10¢ blue top left sheet margin copy tied neat clear violet AUGUSTA / Ga. MAR / 4  CDS on cover to “Capt. J. C. Wrenshall, Macon, Georgia”, stellar stamp and scarce beautifully struck color cancel only used late in the war, cover reduced slightly irregularly at left. Docketing at left as from Mrs. Geo Yonge. Wrenshall was married to Letitia Yonge. 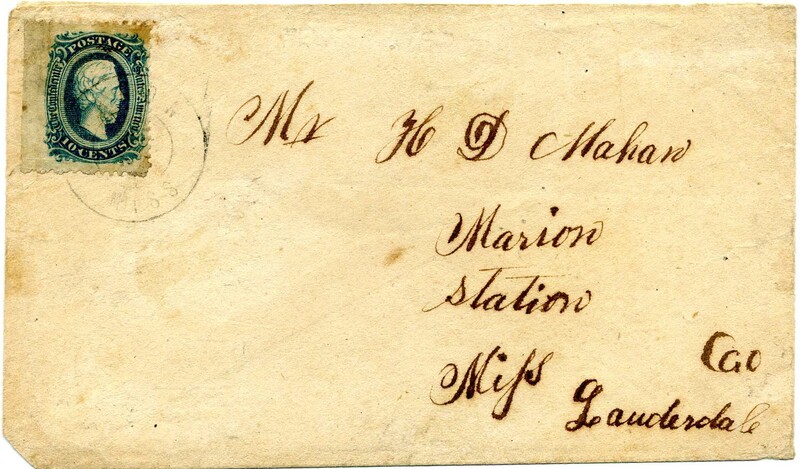 The addressee was a staff officer in the Engineer Corps. J. C. Wrenshall was one of the three engineers noted as founding members of the Baltimore Chapter, American Institute of Architects, 1870-71. $300. 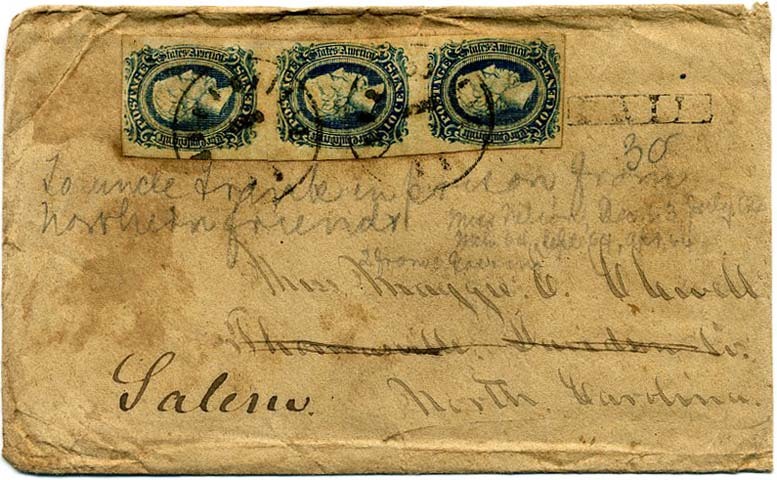 CSA 11, 10¢ milky blue (4 large margins) tied WILMINGTON / N.C. // MAY / 15 on clean homemade cover to Hon. 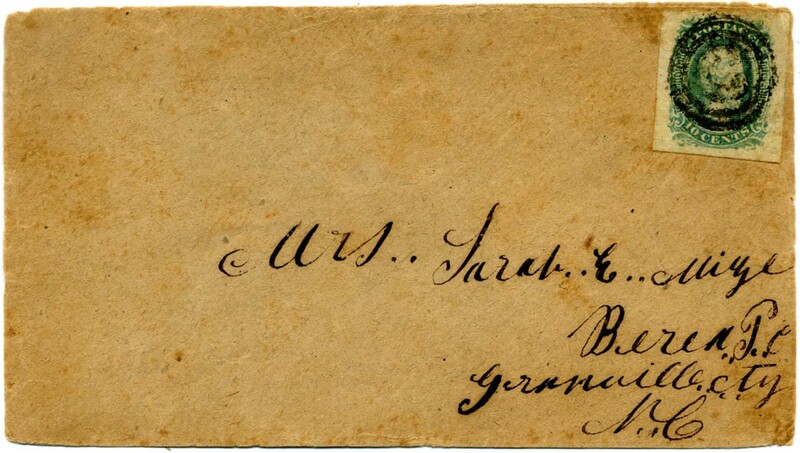 William A. Graham, Hillsboro, N.C.; docketing as from John W. Graham, Extremely Fine. $160. 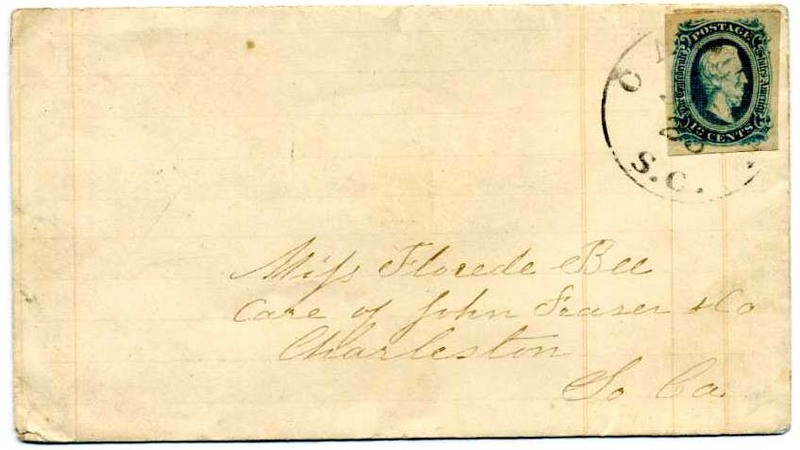 CSA 11, 10¢ blue (4 nice margins) tied CAMDEN / S.C. // JUN / 23 cds on adversity cover fashioned from ledger paper, addressed to Miss Florede Bee, Care of John Feaser & Co., Charleston, So Ca. Van Dyk MacBride pencil note on verso saying “Superb / Beautiful item” $170. 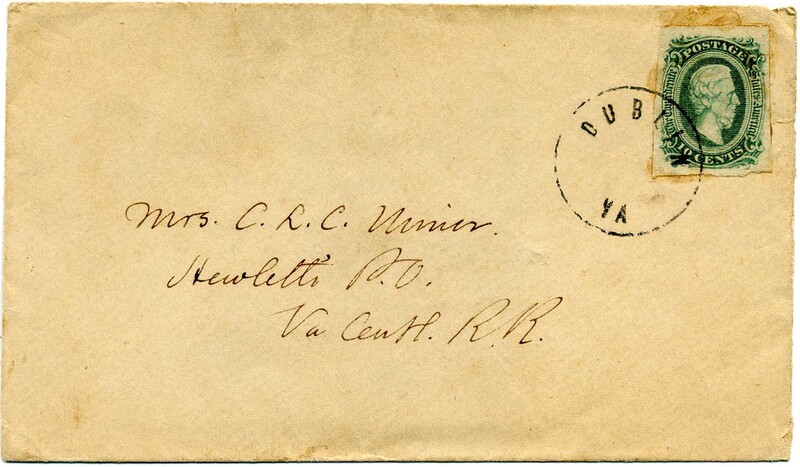 CSA 11, 10¢ blue (4 large to huge margins) tied neat bold RICHMOND / Va. // MAY / 2 / 1863 cds on cover to John W. Park, Esq., Greenville, Meriwether Cty; docketing up the side “Important letter about Soldiers claims viz John Douglas & Mrs. Thomas”; 1983 PFC stating genuine 11c greenish blue shade. Does not look even remotely greenish to me but appears could have been some color change in 30 years. $150. 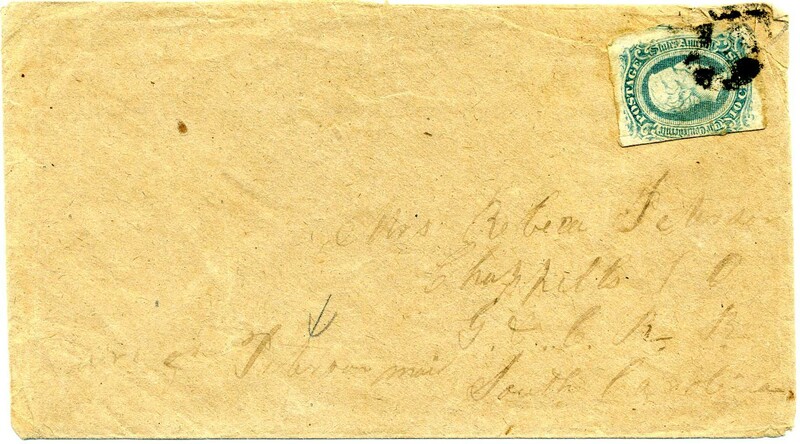 CSA 11c, 10¢ bluish green used on homemade cover with manuscript cancel of “Green Pond SC / F[ebruar]y 22 to Mrs. Jeanie M. Waller, Care of Lieut. Wm. G. Waller, Augusta Arsenal, Georgia (an ordnance officer). Now the Augusta College Campus, this land served as a US arsenal for more than 128 years. First commissioned by President George Washington in 1793, the first arsenal was located near the river in 1816, near where the future Confederate Powderworks was to be located. During the Civil War, the arsenal manufactured a variety of ordnance for the Confederate Army. $180. 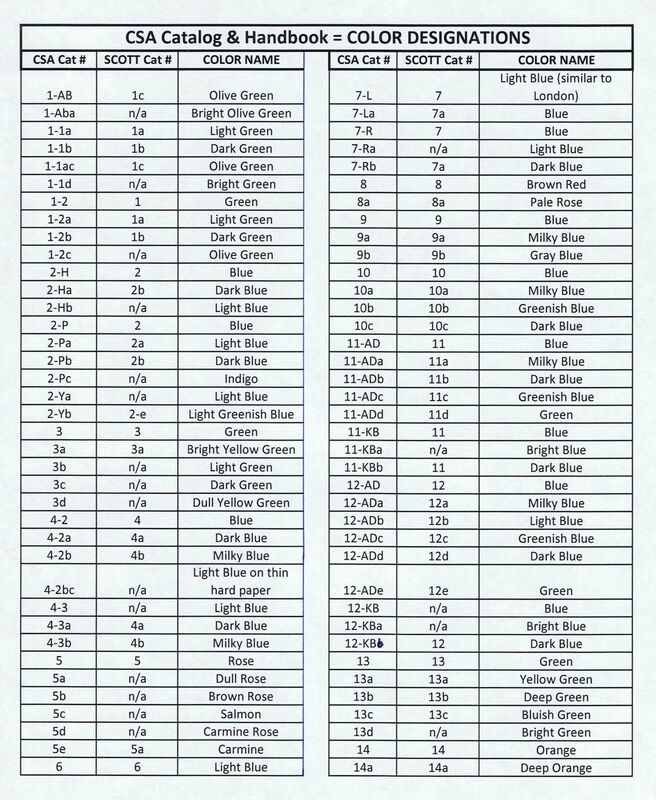 CSA 11, 10¢ dark blue (4 ample to large margins) tied by neat blue CHARLOTTE C.H. / Va. // JUN / 15 cds; addressed lightly penned, Ex Ken Whittle. $140. 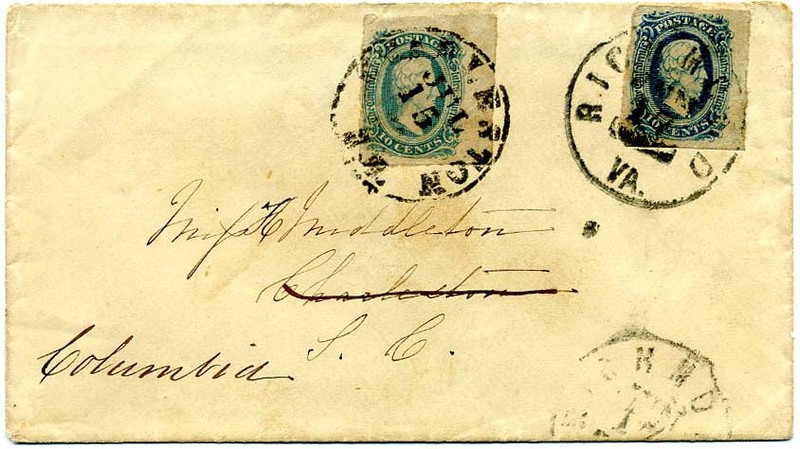 CSA 11, 10¢ light blue (4 margins) tied bold neat RICHMOND / Va. // JUN / 14 / 1863 cds on clean homemade cover to N. L. Blakemon, Sangersville, Va.; slight irregular reduction at right. $150. CSA 11, 10¢ blue with enormous margins all around used with manuscript cancel of Thorn Hill Virginia on small rumpled homemade cover to Miss Lottie Lee Quarles, Gordonsville, Orange (County), Va. $90. 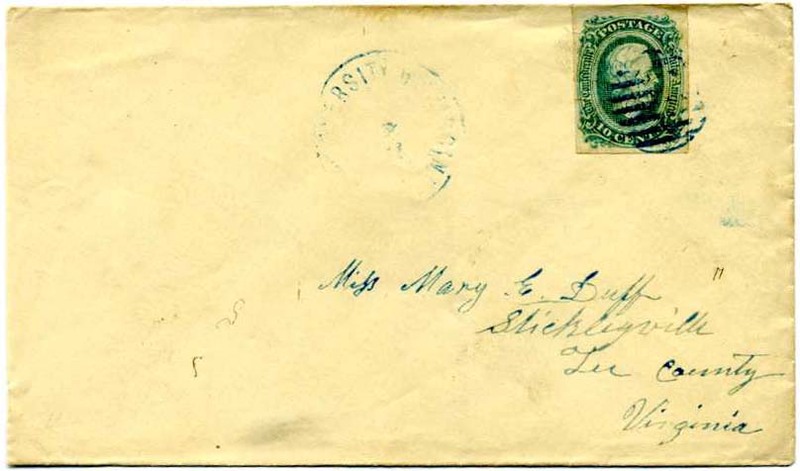 CSA 11a, 10¢ milky blue tied very lightly struck South Carolina double circle postmark on wonderful adversity cover to “Miss Augusta E. Fripp, Greenville C.H., So. Carolina,” descendant of pirate Johannes Fripp, member of the wealthy antebellum cotton plantation family; in modern times, Fripp Island was used as a film set for Disney’s The Jungle Book. Cover fashioned from a printed Confederate military circular concerning affairs in South Carolina, “...to order elections for field officers... First Corps of Reserves and certain others....” Accompanying information / records. $400. CSA 11c, 10¢ bluish green tied RICHMOND / VA // DEC 10  on cover to Lt. Wm. K. McKnight, Co. E, 17th Va. Regt., near Ivor Station, P & N. R.R. (Petersburg and Norfolk Railroad) with excellent original letter on CSA War Department / Ordnance Department letterhead date Richmond December 8th, 1863 from Charles to his brother regarding transferring Confederate Personnel to England and saying, in part, “...Col. Rhett has gone to England...The pants you sent... were too small...I carried them down to Mr. Ateller, who superintends the cutting of uniforms and revisions, and he gave me in place of them a larger pair of much finer goods, which he said was the only pair of that kind he had in the house...Everything has become so quiet...I would like it if you could come up and spend Christmas, but I am afraid that eggnog will not flow very freely...Congress meets next Mon., and all eyes are turned towards them in hope something may be done for the currency...as the rate is now 22 [Confederate dollars] for one [Greenback]....” Containing valuable information on location of the 17th Va. during the winter of 1863-64; after Gettysburg, the 17th had retreated to the Culpeper area. Clues in this letter seem to answer the question of whether the unit had accompanied Lee or Pickett. Mentions Hunton’s Brigade; Gen. Eppa Hunton was present at the May 1861 Virginia secession convention; he held the unpopular but prophetic view that secession would avoid war – by leading to a negotiated settlement in which Northern money would be tapped to industrialize the South. The writer’s mention of trading trousers reflects the growing shortage of clothing in the Confederacy; indeed, some Confederate soldiers marched to Gettysburg barefoot. The epic battle might have unfolded rather differently if troops had not detoured, to loot a Pennsylvania shoe factory. Neatly penned in a watery light brown, but bold and legible. Full transcript, other info’ and military records included. $850. Charles Henry McKnight (1840-1916) was in Co. A, 17th Virginia Infantry, taken prisoner at Williamsburg and discharged 9-10-62 for loss of an arm. Postwar, he was a clerk. Bureau of Ordnance 1862-65. William Presley McKnight (1838-1927) was in Co. E, 17th Virginia Infantry, taken prisoner at Frazier’s Farm, exchanged and then wounded a month later at Sharpsburg; returned and taken prisoner again at South Anna Bridge, Va (escaped). Rose to the rank of 1st Lieut. Took oath of allegiance 5-31-65 at Alexandria. Postwar he was advertising manager for Alexandria Gazette. 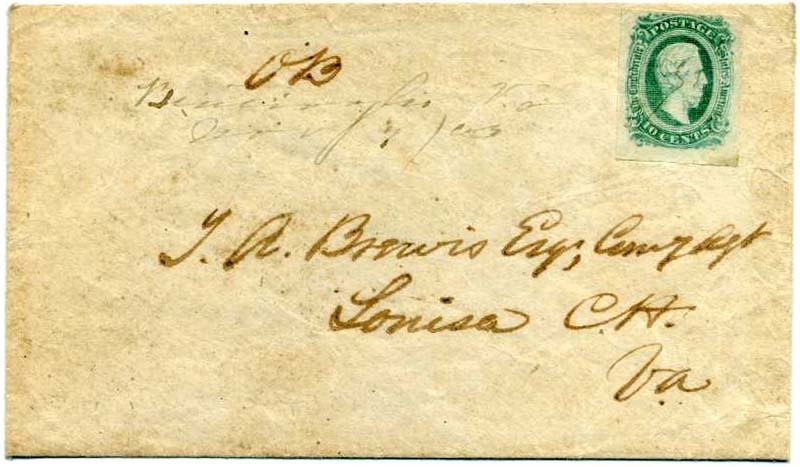 CSA 11c AD, 10¢ bluish green (4 huge margins all around) used on cover with manuscript cancel of Blackstocks SC // June / 12; addressed to Rev. Mw. R. Hemphell, Due West Corner, So. Carolina / Abbeville Dist. ; slightly water stain at bottom $125. 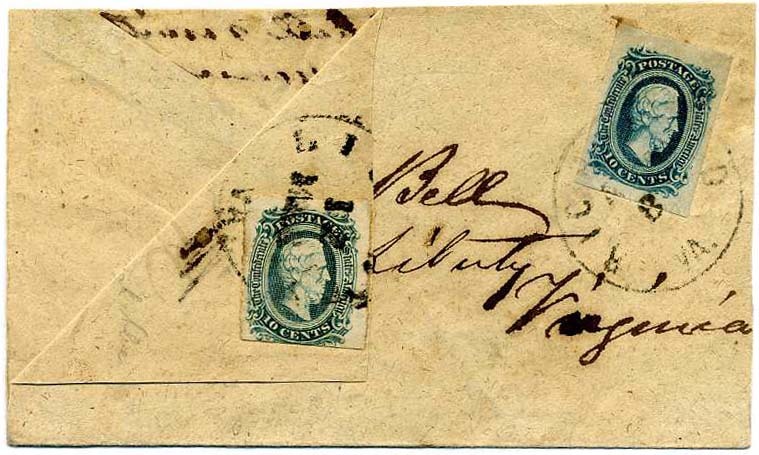 CSA 11c, 10¢ bluish green, 4 margins, tied blue UNIVERSITY OF VIRGINIA / VA double circle on turned cover to Rev. J. 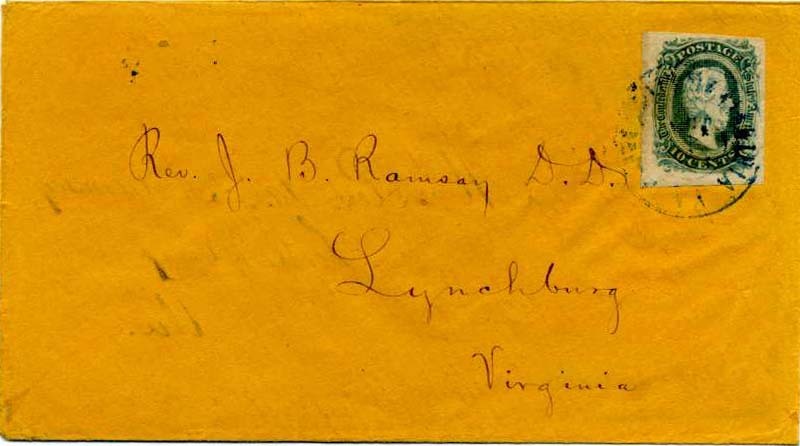 B. Ramsey, D.D., Lynchburg, Virginia; inside use CSA #12, 10¢ blue with 4 margins tied neat LEXINGTON / Va. // OCT / 22 cds to Mrs. Rev. Jas. B. Ramsey, Lynchburg, Va; open 3 sides to display with neat penciled Judd notations. Ex Judd and Thacker. Rev. James Beverlin Ramsey gave a eulogy on the occasion of the death of Lieut. Gen. T. J. Jackson. $425. CSA 11, 10¢ blue tied blue grid with matching UNIVERSITY OF VIRGINIA / VA double circle on turned cover to Mrs. A. C. Hopkins, Hampden Sidney, Prince Edward Co, Va.; inside use franked with CSA #12, 10¢ blue (4 margins) used with manuscript cancel “H.S. 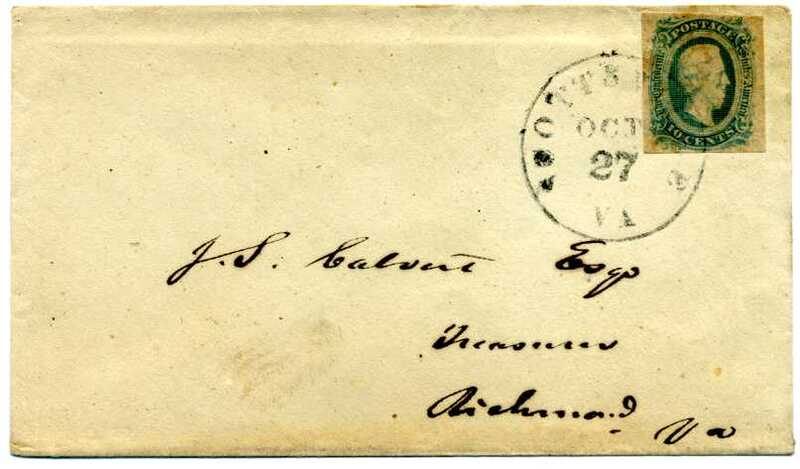 College Va / Oct 24 63”; addressed to”Rev. A. C. Hopkins, Chaplain 2nd Regt. Va. Vols., Stonewall Brigade, Johnson’s Division, Ewell’s Corps, A.N.V.” Open 3 sides to display. Ex Thacker. Wonderful double college use with great military address. $425. Abner Crump Hopkins (1835-1911) was Chaplain of the 2nd Va Regiment, Genl Paxton’s Brigade in Genl T. J. Jackson’s Army of the Valley of Va. He was an 1855 graduate of Hampden Sydney College and a Presbyterian minister. He was commissioned Chaplain of the 2nd Va Inf 5/3/1862 and was later promoted Chaplain of the entire 2nd Corps ANV; during this time he was Stonewall Jackson’s personal chaplain. After the war, he lived in Charlestown, West Virginia. 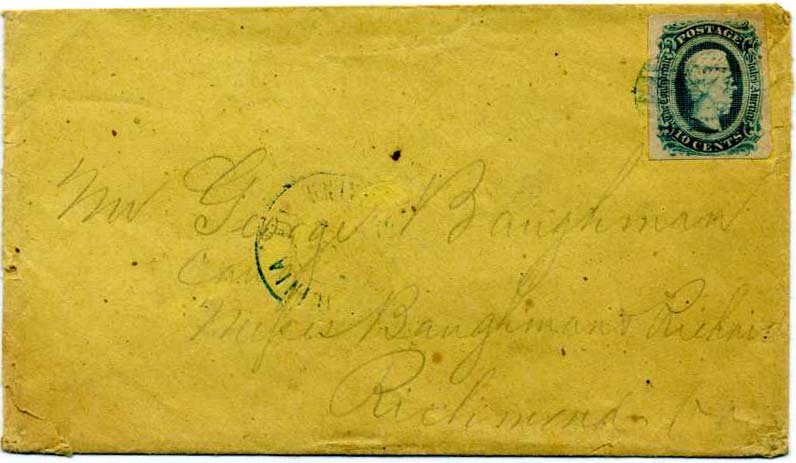 CSA 11, 10¢ blue (4 margins) tied blue grid with matching lightly struck UNIVERSITY OF VIRGINIA blue double circle on cover to Mr. George Baughman Care Messrs Baughman & Richard (George’s stationery business), Richmond, Va.; slight tear at lower left corner otherwise Fine, Ex Thacker. $140. 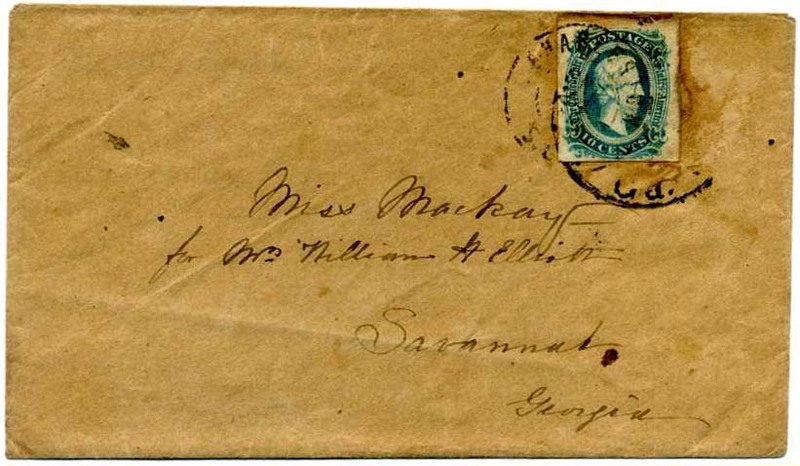 CSA 11c AD, 10¢ bluish green tied with blue grid with matching UNIVERSITY OF VIRGINIA blue double circle on cover to Miss Sarah J. Mabanes, Stony Point, Albemarle Co., Va.; Ex Rosenberg and Thacker $180. CSA 11c AD, 10¢ bluish green tied by neat UNIVERSITY OF VIRGINIA // SEP blue double circle on cover to Mrs. Elisabeth Creacy, New London P Office, Campbell County, Va.; Ex Thacker $150. 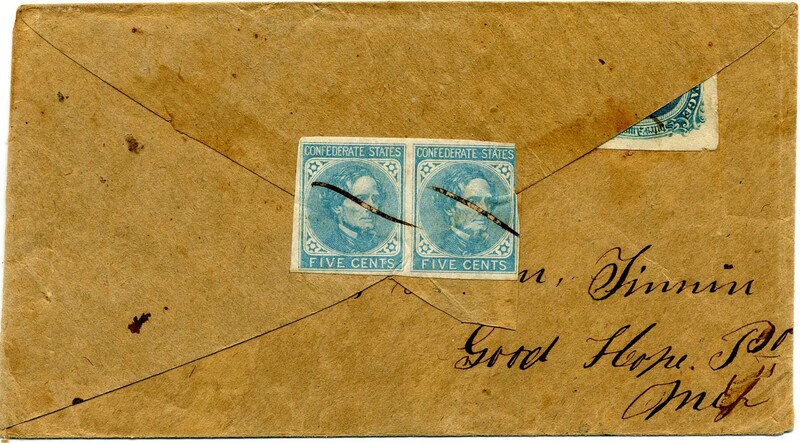 CSA 11 AD, 10¢ blue (4 margins, couple pre-use creases) tied blue grid with matching lightly struck UNIVERSITY OF VIRGINIA double circle on cover to Miss Mary E. Duff, Stickleysville, Lee County, Virginia; Ex Thacker. $140. CSA 11d AD, 10¢ dark blue (4 large even margins) used with manuscript cancel of Bentivoglio Va / April 26  with contents docketing “April 23, 64” on blue cover with address in magenta ink to Mrs. Samuel E. Wilson, Mayesville, So., Carolina, Ex Thayer and Thacker. $180. 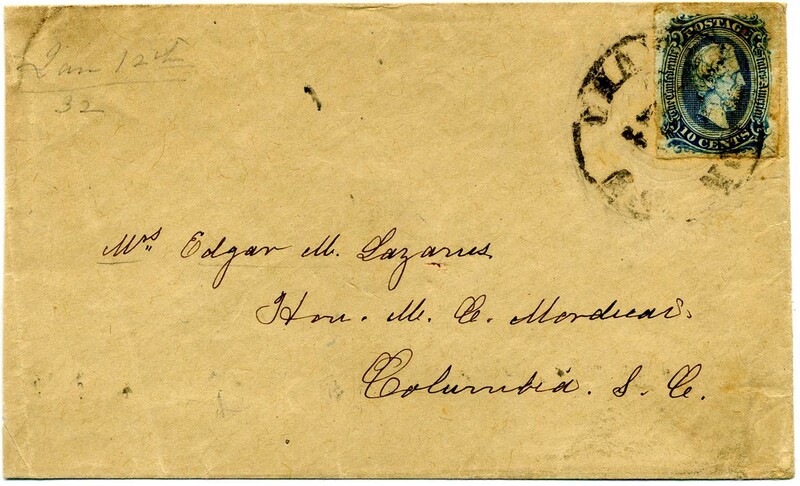 CSA 11d AD, 10¢ greenish blue used with manuscript cancel of Bentivoglio Va / Nov 7 / 63 on turned cover to T. A. Brevis (?) Esq Comy (Commissary) Agent Louisa C.H., Va. with manuscript “O.B.” (Official Business); inside use addressed but without postal markings so probably delivered by military courier; Ex Kohn and Thacker. $160. CSA 11c, 10¢ greenish tied nice KESWICK DEPOT / VA // 22 / MAR cds on cover to Miss Mattie J. Trevillian, Trevillians Depot, Louisa County, Va.; the largest cavalry battle of the Civil War, the Battle of Trevilian Station, was six miles west of the town limits. Ex B. Green and Thacker. $150. CSA 11c, 10¢ greenish with huge top margin tied nice MECHUM’S RIVER / VA. // SEP / 19 cds on cover to Miss Tinsley Winston, East Point, Ga.; Ex Thacker. $120. 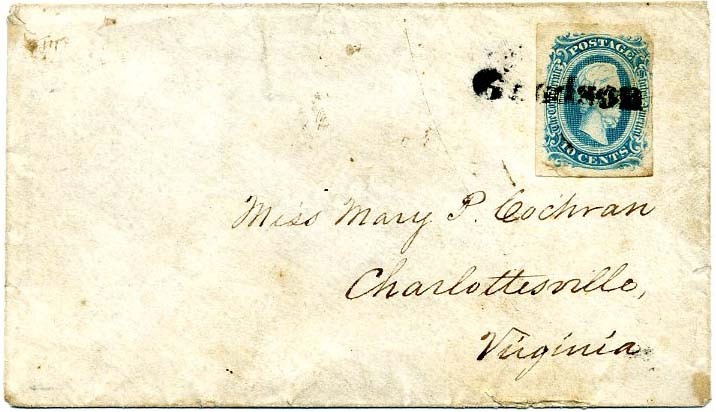 CSA 11-AD, 10¢ blue (4 margins) tied SCOTTSVILLE / VA // JAN / 14 cds on small clean neat cover to Mrs. C. C. Cocke, Bremo Bluff P.O., Fluvanna Cty [Va]; Very Fine, Ex Thacker $140. Dr. Cary Charles Cocke, a physician, was born in 1814 and died in 1888. His father was Confederate General John Hartwell Cocke - Virginia planter, reformer, general, and statesman as well as a director of the James River and Kanawha Company and a member of the board of visitors of the University of Virginia. CSA 11-AD, 10¢ blue tied neat clear SCOTTSVILLE / VA // OCT / 27 cds on small fresh cover to J[ohn].S. 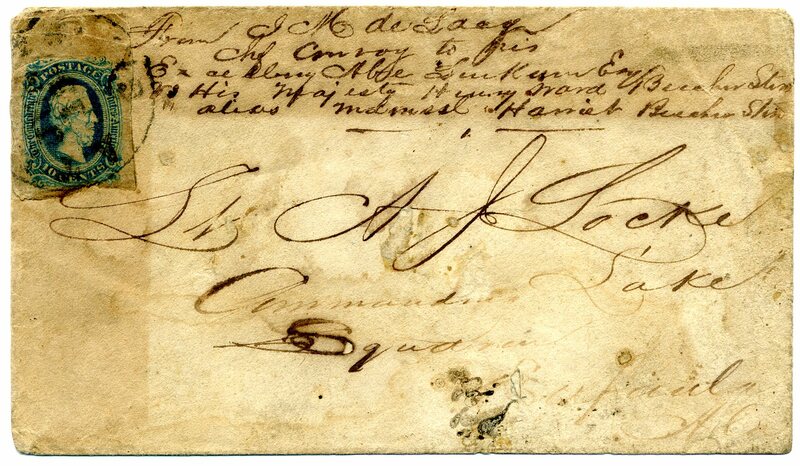 Calvert Esq., Treasurer [of the Commonwealth], Richmond, Va.; Ex Thacker $150. 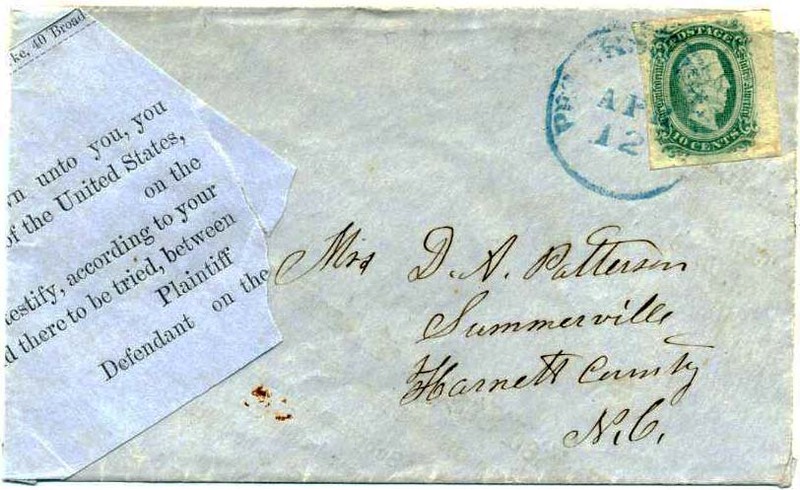 CSA 11, 10¢ blue right sheet margin tied blue PETERSBURG / Va. // APR / 12 cds on adversity cover fashioned from pre-war U.S. / South Carolina state legal document, addressed to Mrs. D. A. Patterson, Summerville, Harnett County, N.C.[VA] [NC] $200. 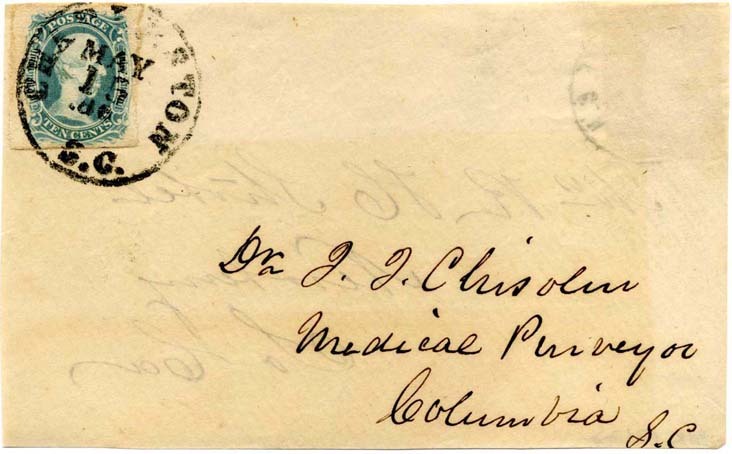 Dr. John Julius Chisolm (1830-1903) was appointed to the rank of surgeon in the Confederate Army and ordered to Charleston to establish a medical purveyor's office. Much more information on linked page. 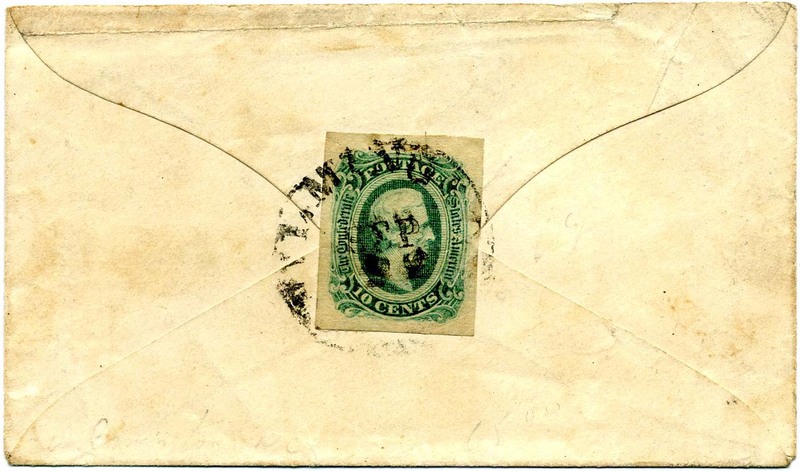 CSA 11d, 10¢ green tied by PITTSBORO / N.C. cds on slightly soiled cover to Capt. Claude B. Denson, 2nd Regt Engineer Troops, Wilmington N.C. Denson served in Co. E, 20th North Carolina State Troops. He was an engineering graduate from VMI and assigned various engineering duties in NC and VA. He did good work at Fort Fisher, Wilmington, NC. He surrendered in Greensboro 1865. Scarce stamp shade. $200. 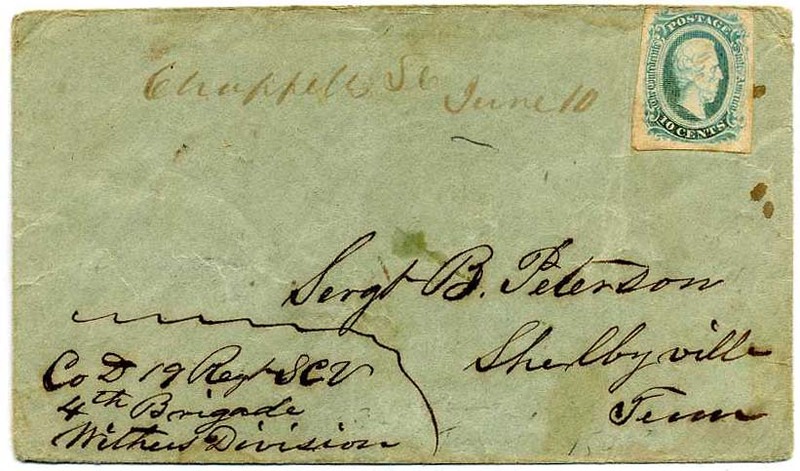 CSA 11, 10¢ blue used on pale green turned cover with manuscript cancel of Chappells SC June 10, addressed to Sergt B. Peterson, Shelbyville Tenn. Co D 19 Regt SCV 4th Brigade Withers Divison [Army of Tennessee]; inside use SHELBYVILLE / Ten. cds with matching DUE 10, CC Type E (CV $250) addressed to Doctor Jas. F. Petrson, Chappells T O (Turn Out), G & C R R, South Carolina Care of Jas M. Richardson and endorsed by Sergt Baz Peterson 7th Co 19th S.C.V. Really neat fully exploded cover to / from Bazil Peterson, age 29 who entered military as a sergeant and rose to 2nd Lieut. August 1864. $400. 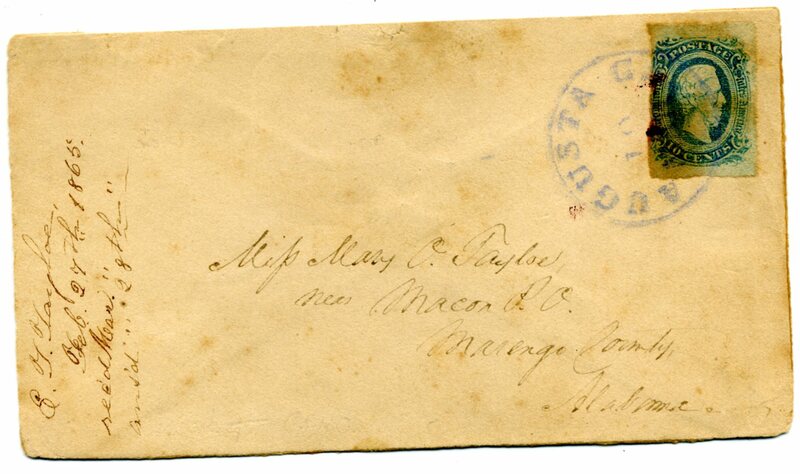 CSA 11-AD, 10¢ blue bottom sheet margin and second copy on wonderful overweight legal size envelope tied together by MACON / GA // JUN / 10  double circle cancel addressed “To the Clerk of the Confederate District Court for Cape Fear District, Saulsbury (sic) North Carolina” with official endorsement at upper left “Confederate States by D. G. Ramseur Receiver vs. C. M. Hitchcock, Deft.” (defendant) with further postmaster’s notation at lower left “Rec’d this packet (sic) from E. C. Groniss Esq., one of the Commissioners to be forwarded by due course of mail this June 20th 1863. C. B. Graybill, Asst. 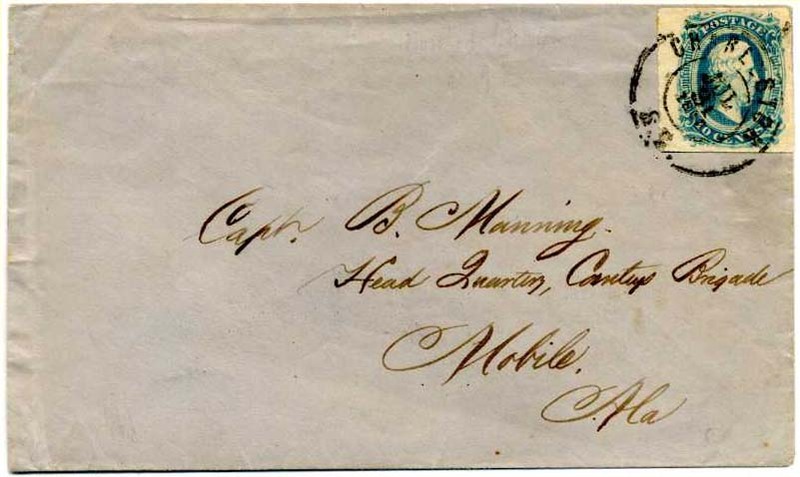 PM” Manuscript “Forwarded Due 10” with bold cds of SALISBURY / N.C. // JUN / 24 / 1863 cds and redirected to Concord, N.C. Exceptionally nice forwarded legal use. $450. 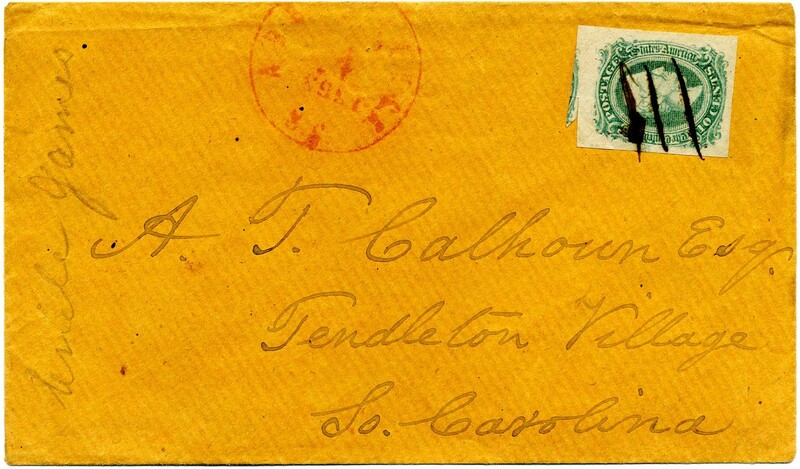 CSA 11-AD, 10¢ blue tied RICHMOND / VA. // APR / 30 cds on cover; stamp accidentally folded over before cancellation so that CANCEL APPEARS ON BOTH SIDES OF THE STAMP; cover addressed to Miss Callie Harrison, Leatherwoods [Store], Henry County, Va.; 2007 CSA Certificate 05034. Showy Post Office mistake. Ex Wiseman. $250. CSA 11-AD, 10¢ blue tied STAUNTON / Va. cds on neat clean homemade cover to Hon. Henry D. (Saussure?) Charleston South Carolina redirected to Cedar Spr[in]gs with bold clear CHARLESTON / S.C. // AUG / 1 / 186_ and large [DUE] 10. Lovely forwarded use. $325. CSA 11e-AD, 10¢ blue OFFICIALLY PERFORATED tied with indistinct cds and second equally indistinct strike at right on turned cover to Mrs. Susan H. Pettus, Scooba Miss with notation at lower left “Per Willie F.”; inside use is blurry strike of SCOOBA / MISS // JAN / 24 with straightline PAID (no rate), addressed to Miss Eugenie A. Ferris, Macon, Miss. Fully exploded with slight edge reduction; 1983 CSA Certificate 01396. SCV $750. $550. 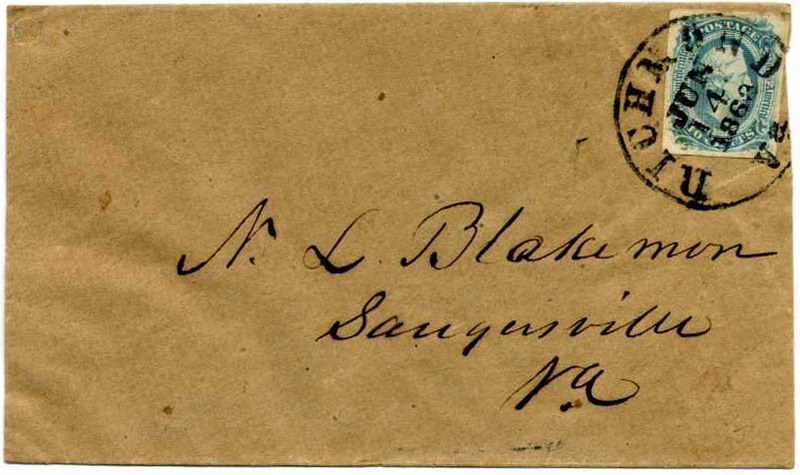 CSA 11-KB, 10¢ deep blue (4 margins) tied beautifully struck BLACK PETERSBURG / Va. // JAN / 24 [ 1865] cds on clean blue cover to Mrs. Susanna Frank, Cedar Bush, Davidson County, NC. LATE USE and scarce black Petersburg only used very late in the war - late December 1864 - March 1865. $180. 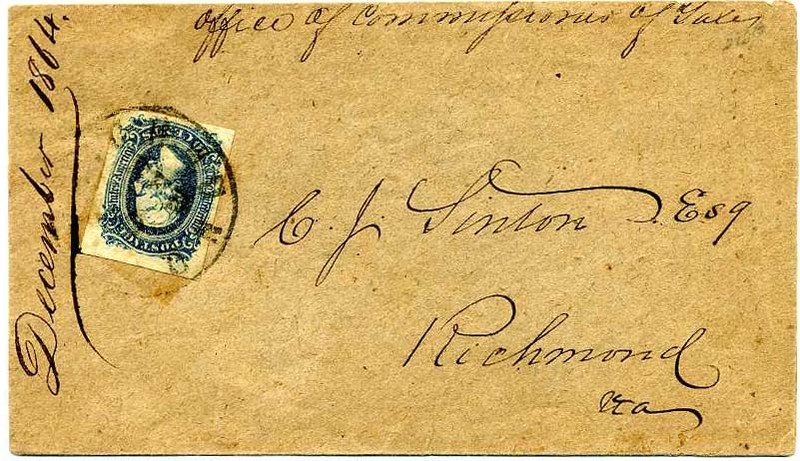 CSA 11-KB, 10¢ deep blue (4 margins) tied RICHMOND / VA. cds on pristine manuscript semi-official cover with ms “Office of Commissioner of Taxes” at top, addressed to C. J. Linton, Esq. 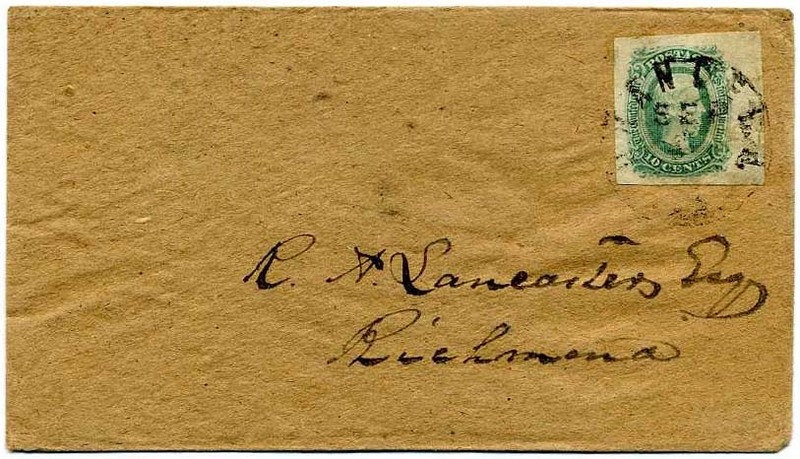 Richmond, Va. thus an OVERPAID DROP cover with docketing up left side “December 1864”. $200. 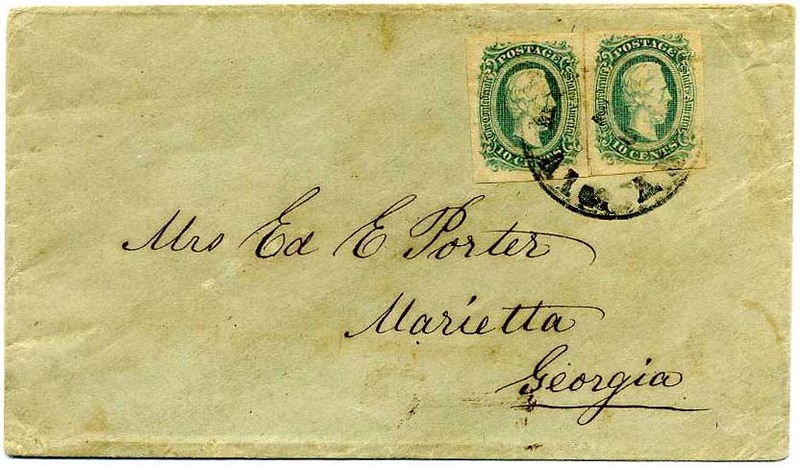 CSA 11c-AD, 10¢ bluish green – two 4-margin singles tied MONTGOMERY / Ala. cds on double weight pale green cover to Mrs. Ed. E. Porter, Marietta, Georgia. Cover appears to have been sent by Capt. Edward E. Porter to his wife. Edward E. Porter was Captain of Co. C, 2nd Miss Partisan Rangers Cavalry. He also had service in the 3rd Ten Cav (Nathan Bedford Forrest’s Command), but that unit was disbanded in November 1862. Information on Capt. Porter’s service record is sketchy. $250. 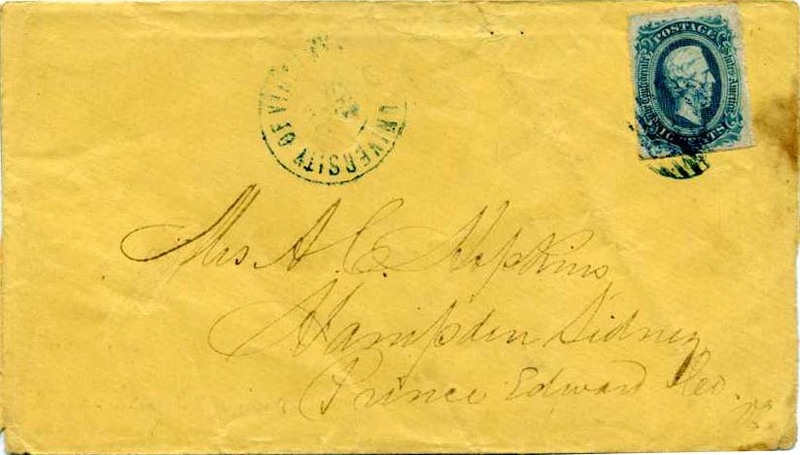 CSA 11c-AD, 10¢ bluish green (4 margins) used with scarce 10-bar Army of Northern Virginia field cancel, CSA Catalog ANV-11 (used 1864-65), on cover to Miss E. M. Smithson, Macfarlands, Lunenburg [County] Va. One of the scarcer ANV field cancels. $200. 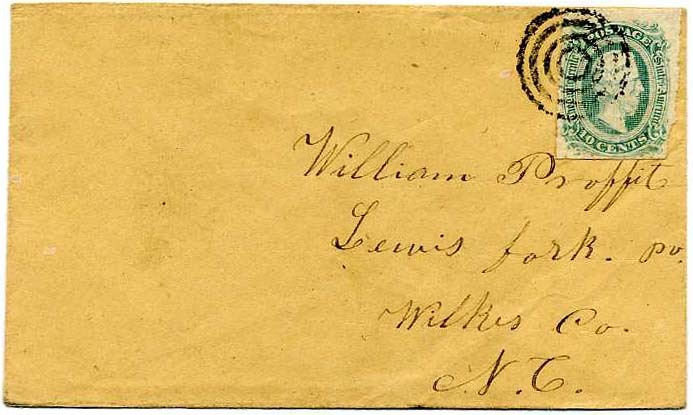 CSA 11c-AD, 10¢ bluish green (4 margins) used with Army of Northern Virginia target field cancel, CSA Catalog ANV-13 (used 1863-65), on cover to William Proffit, Lewis Fork PO, Wilkes Co. N.C. From Andrew J. Proffit home to his father, William Morgan Proffit, Jr. $180. Andrew J. Proffitt (Proffit, Prophet) was mustered into Co. D, 18th NC Infantry. Much more information on linked page. 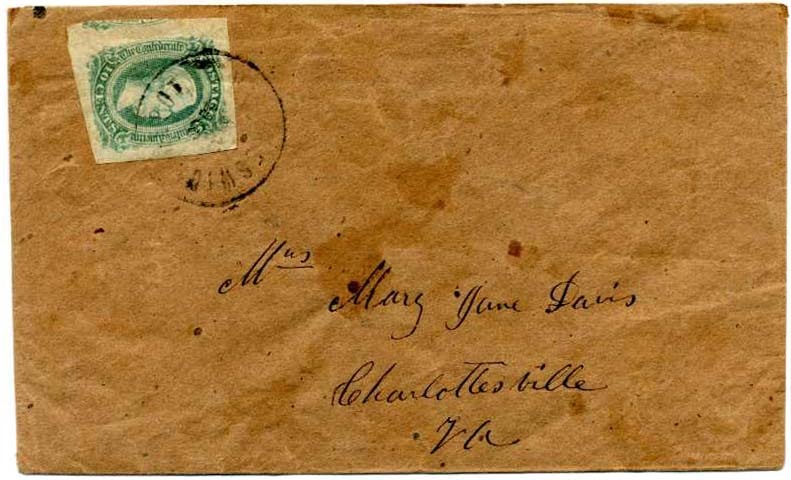 CSA 11c-AD, 10¢ greenish blue (4 huge margins) tied Army of Northern Virginia field cancel, CSA Catalog ANV-13 (used in 1863-65), on small neat homemade cover to Mrs. John Devereux, Raleigh, N.C. with endorsement “Soldier’s Letter” at upper left. $170. Major John Devereux was the state's chief quartermaster. Much more information on linked page. CSA 11-AD, 10¢ blue tied by RICHMOND / Va. // ? 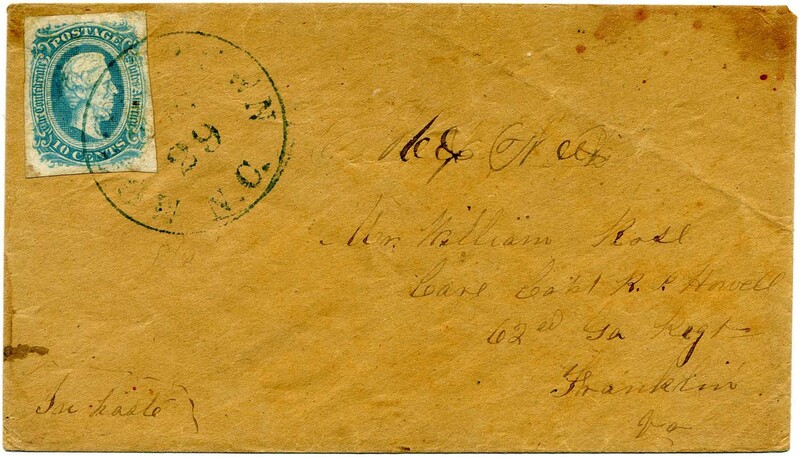 / 8 on turned cover to O. P. Bell, Liberty, Virginia; inside use franked with CSA 11c-AD, 10¢ greenish blue tied by LIBERTY / Va. cds and addressed to W. Bell in Richmond, envelope fully exploded and slightly reduced edges. $325. CSA 11-ADc, 10¢ bluish green right sheet margin single tied ORANGE C. H. / Va. // SEP cds on neat homemade cover to R. A. Lancaster, Esq., Richmond $170. 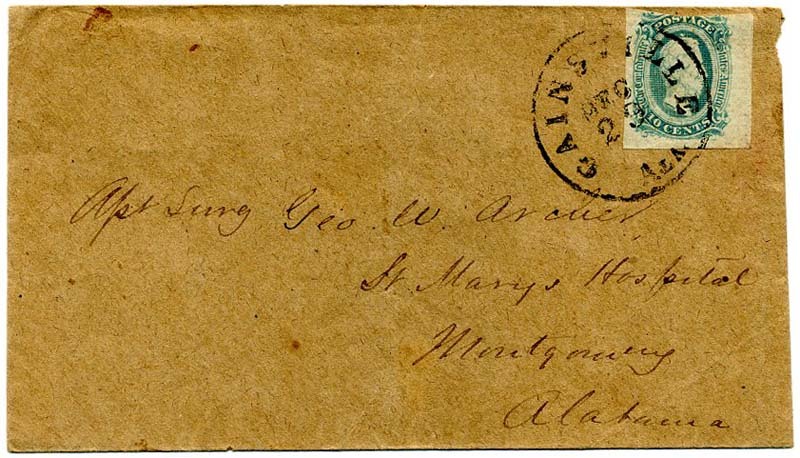 CSA 11, 10¢ blue bottom sheet margin single used with pen strokes and matching “96 SC, Mch 7” (town of NINETY SIX) on neat cover to Co. A. M. Norris, Cuthbert, Georgia; very slightly reduced at left. $180. CSA 11, 10¢ blue tied by JACKSON / MISS. // MAY cds and second strike on adversity cover made from a printed document, addressed to Mrs. L. E. Lumpkin in Monticello, Miss. ; back flap tears, some toning. $250. Dr. Henry Morris Jones was in 1st Texas Partisan Rangers, Lane’s Company. He is listed as Assistant Surgeon Capt. W. G. Moseley's Light Artillery [Texas] Much more information on linked page. 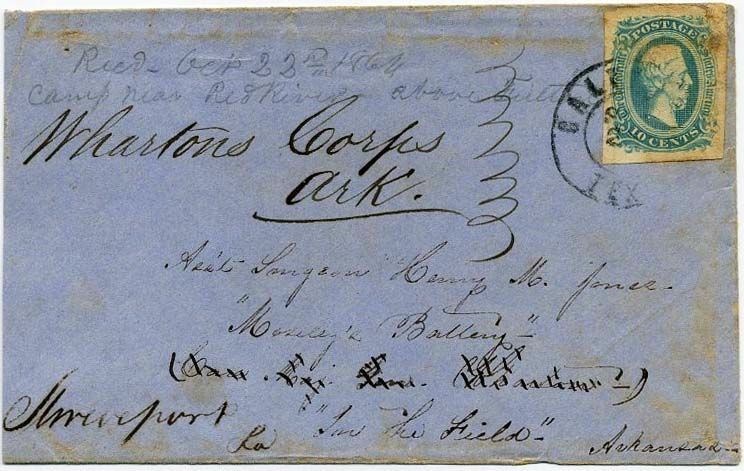 WARRENTON / N.C. // SEP / 13 cds with matching PAID 10 on a TURNED COVER to Mrs. S. T. Stuart Care of Maj. S. T. Stuart, Bentivoglio P.O., Albemarle Co, Va.; inside bearing a CSA 11, 10¢ blue tied with manuscript cancel of Bentivoglio Va Sept 24, 1864. Most of one side flap missing. $250. 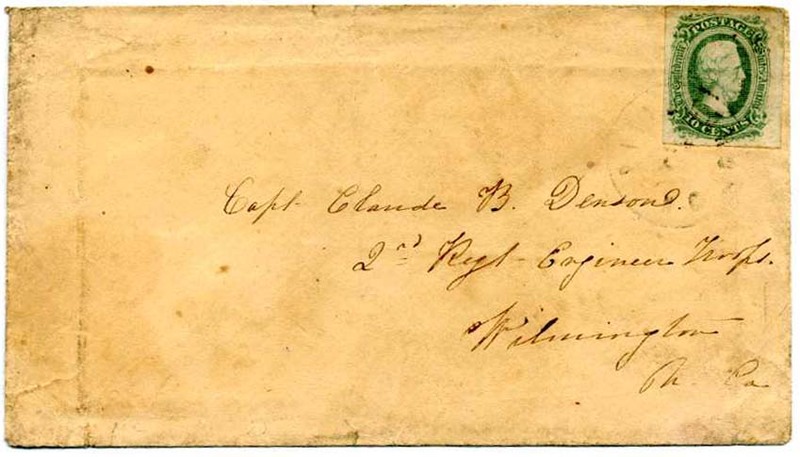 CSA 11, 10¢ blue (4 ample to huge margins) tied RICHMOND / Va. // JUN / 24 cds on cover to Lieut. Col. Archer Andersen, Asst. A. Genl, Inspection Duty, Salisbury, N.C. $150. Lt. Col. Archer Anderson (1838-1918) was the oldest son of Confederate General Joseph Reid Anderson, superintendent of the Tredegar Iron Works in Richmond, Virginia. Much more information on linked page. 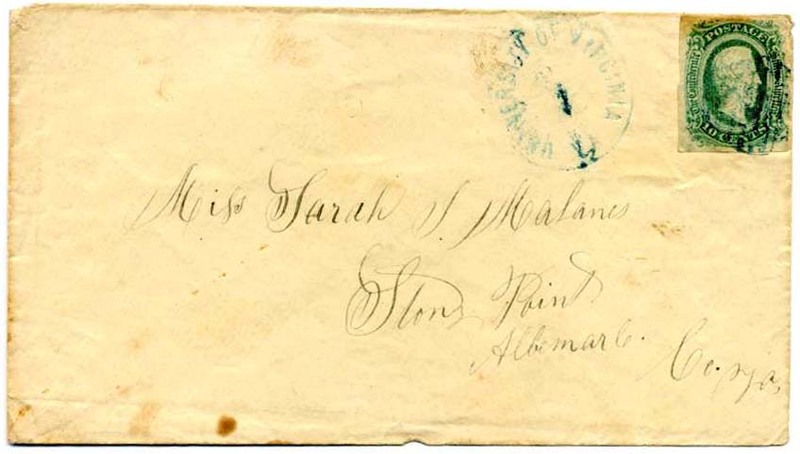 CSA 11c-AD, 10¢ greenish blue (4 large to enormous margins) used with manuscript cancel of “Green Pond SC Feb 19” on small pristine homemade cover to Mrs. Jeanie M. Waller Care of Lieut. Wm. G. Waller, Augusta Arsenal (an ordnance officer). Now the Augusta College Campus, this land served as a U.S. arsenal for more than 128 years. First commissioned by President George Washington in 1793, the first arsenal was located near the river in 1816, near where the future Confederate Powderworks was to be located. During the Civil War, the arsenal manufactured a variety of ordnance for the Confederate Army. $180. 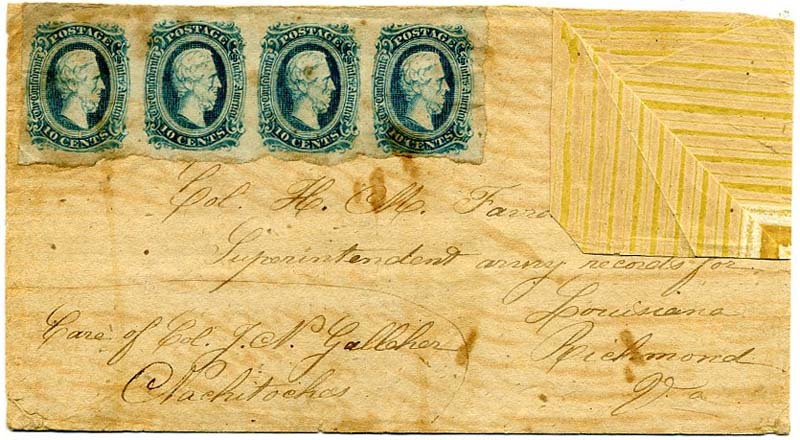 CSA 11, 10¢ deep blue STRIP OF THREE, shade characteristic of Keatinge & Ball printing, tied double strike of unidentified (someone will) postmark and boxed PAID / manuscript “30” – rare combination of markings. 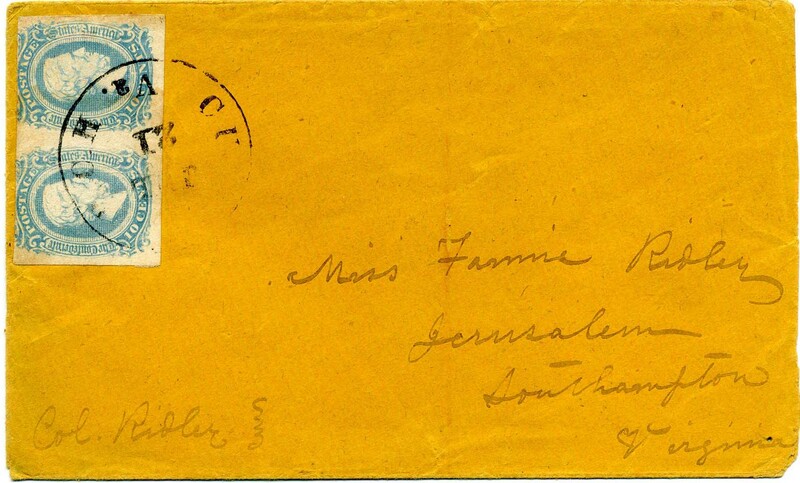 On cover addressed to Miss Maggie E. Clewell (his sister) in Thomasville North Carolina but redirected to Salem; pencil docketing “From Uncle Frank in prison from Northern friends / Mrs. Nelson Rec 13th July 64 / 2 from xxxx”. Slightly reduced at right and a bit war weary but not badly. Frank Clewell was a Confederate Missouri Cavalry officer imprisoned at Johnson’s Island. $600. Francis Christian Clewell (AKA Frank) (1842-1867) was Adjutant of Company I, 1st Regiment Missouri CSA Cavalry and the 1st / 3rd Consolidated Missouri CSA Cavalry. Much more information on linked page. 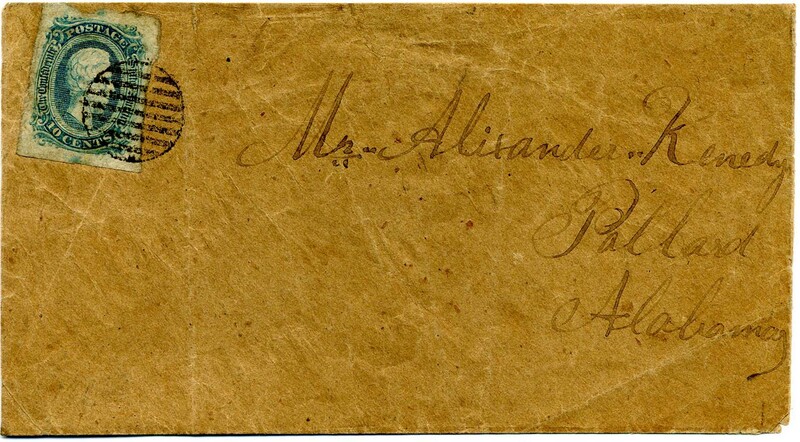 CSA 11, 10¢ blue right sheet margin single tied partial GEORGETOWN / S.C. CDS on turned cover to "A.J. Vidal, Marion Artillery Rantowle's Station Chastn & Sav. R. R." (Charleston and Savannah Railroad - During the war, Sherman's forces completely decimated the line.) 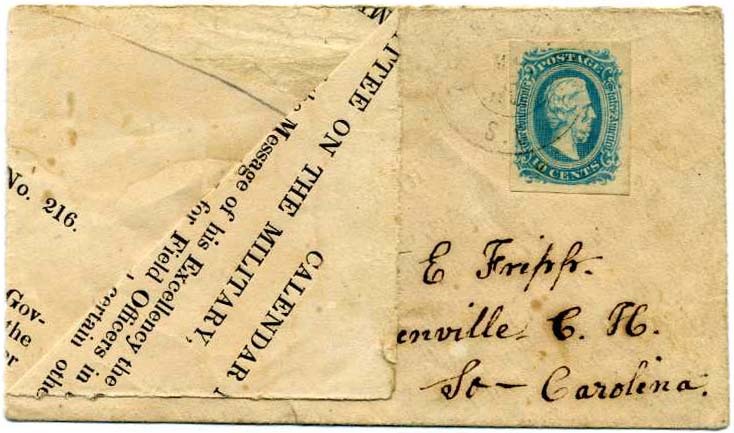 and noted in corner "To be forwarded from Post Office at Charleston S.C."; inside use is a CSA 12, 10¢ blue tied on back flaps (torn on opening) with bold CHARLESTON / S.C. CDS and addressed to "J.F. Fisker, Charleston, S.C." thus making this an overpaid drop cover, a triple threat cover with mixed franking, overpaid drop and military / railroad address! Vidal is listed in military records as a private in Co. C S.C. Marion Light Artillery. $425. 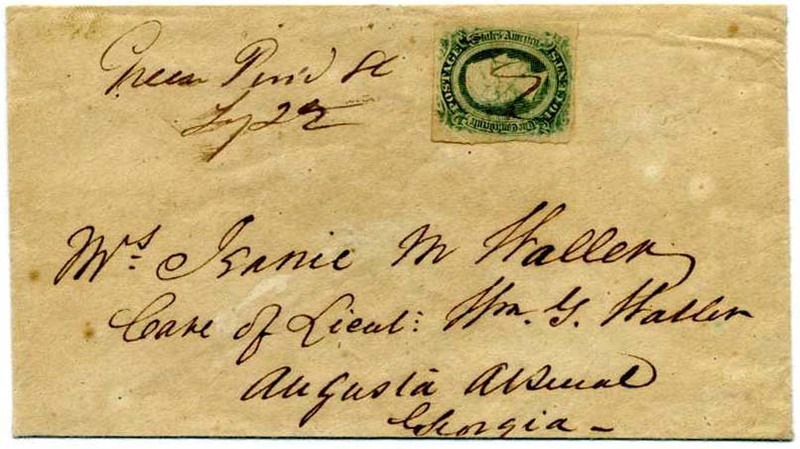 CSA 11-AD, 10¢ blue right sheet margin single tied neat GAINSVILLE / ALA // DEC 29 cds on homemade cover to Asst. Surg Geo. 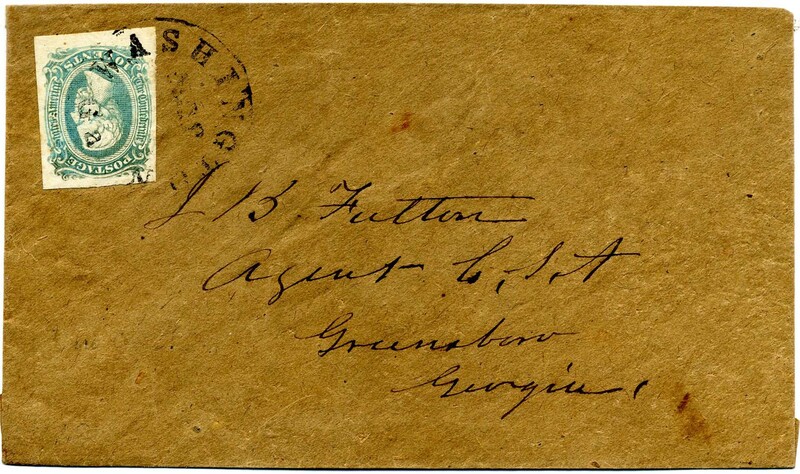 W. Archer, St. Mary’s Hospital, Montgomery, Alabama; back flap tear. Ex Finney. $150. Assistant Surgeon George Washington Archer served the CSA in various hospitals. Much more information on linked page. 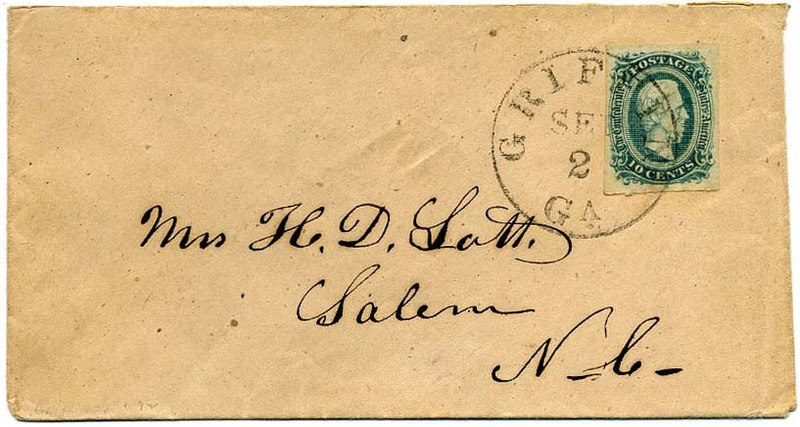 CSA 11-AD, 10¢ blue (4 margins) tied bold neat GRIFFIN / GA // SEP / 2 cds on pristine cover to Mrs. H. D. Lott, Salem, NC. Extremely Fine. $150. CSA 11a, 10¢ milky blue tied boldly struck GREENVILLE / N.C. // SEP / 8 cds on pale yellow cover to William Grimes, Raleigh, NC. Particularly appealing. $270. William Grimes (1823-1884) was born on "Avon Plantation", Pitt County, NC, 2nd of 5 known children born to wealthy planter, Bryan Grimes and (1st) wife Nancy Grist. Much more information on linked page. CSA 11, 10¢ blue tied by "GOODSON" straightline handstamp with month removed (CSA Catalog #SL-03C) on cover to Mary P. Cochran, Charlottesville, Va.; minor soiling just affects stamp, SCARCE CANCEL, according to an article in The Confederate Philatelist (Jan.-Feb. 1994), this marking was in use from Oct. 1863 until the fall of Goodson Va. in the fall of 1864, ex Dietz collection. CCV $1,000. $800. 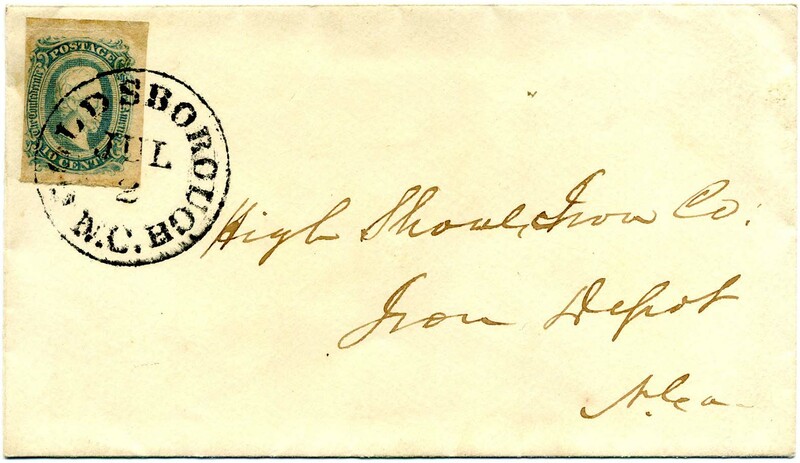 Goodson straightline postmarks were used from mid-September 1863 until the area came under full Union control in late 1864. 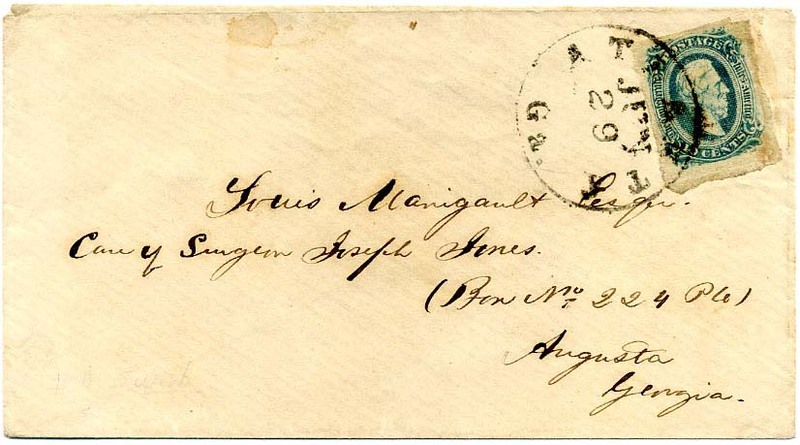 Mail volume from Goodson was quite limited and thus few straightline marked mail from Goodson survives. More information on linked page. 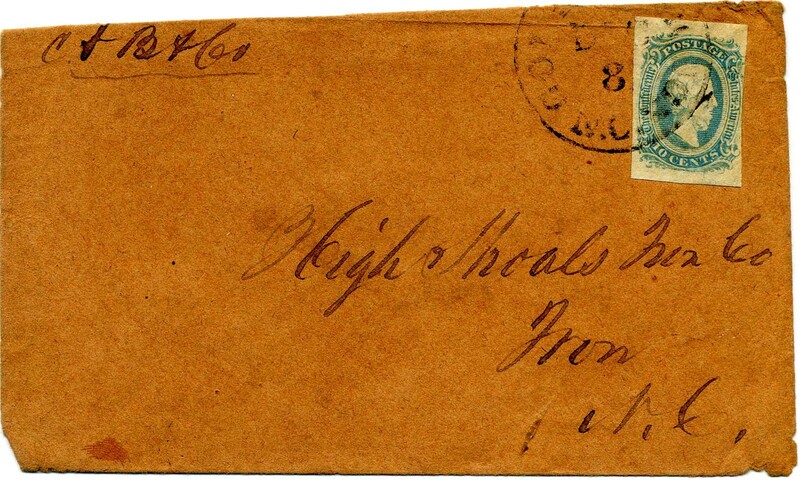 CSA 13, 20¢ green horizontal pair, damaged, just tied CHARLESTON / S.C. dcds on linen-lined legal size envelope to Douglas B. DeSaussure, Esq., Columbia S.C. This was likely overpaid as it was FORWARDED to Thomas Thompson, Esq. in Abbeville S.C. with a 10¢ blue pair, CSA 11, (four margins) tied by lightly struck blue COLUMBIA S.C. cds. UNUSUAL COMBINATION OF STAMPS. Manuscript “[Legal] Opinion” up left side as well as legal case names up right side. Ex Harry McDowell from his Grand Award winning collection. The DeSaussure family was well-known and respected in South Carolina; the family papers are in the SC Historical Society. Douglas served in the 1st SC Regulars Infantry. $600. Listed in both CSA 13 and CSA 11 sections. Extra shipping charges apply. 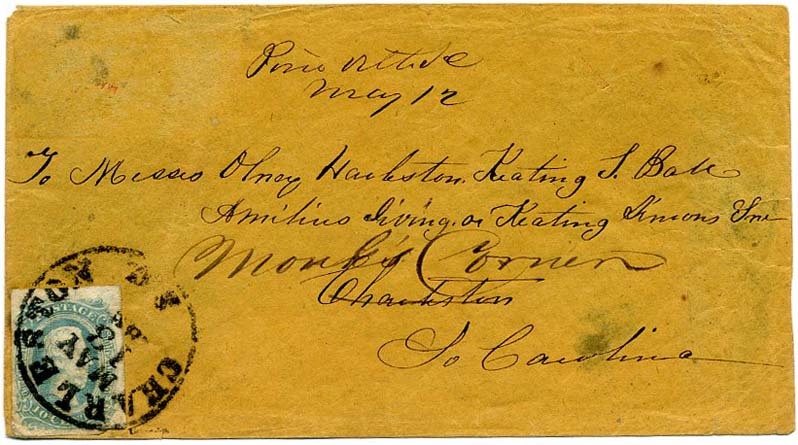 CSA 11a, 10¢ milky blue tied CHARLESTON / S.C. // MAY / 13 / 186_ cds in lower left corner of cover “To Messrs Olmay Harleston, Keating S[imons] Ball, Aemilius Irving or Keating Simons, Charleston. 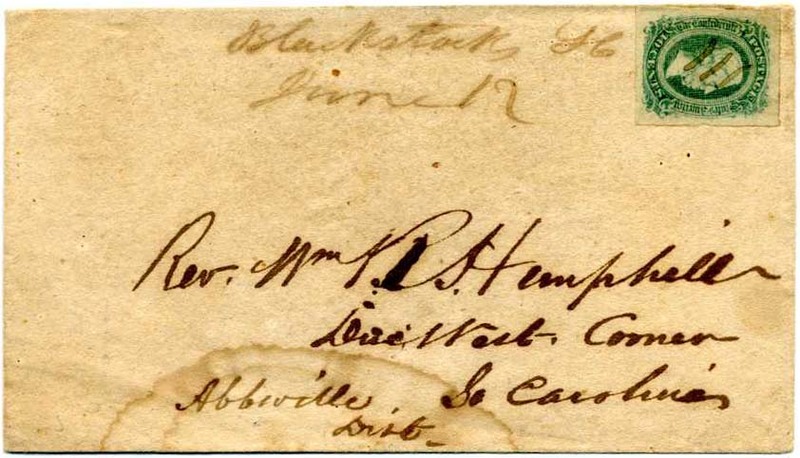 So Carolina” with original stamps removed from upper left where posted with manuscript “Pineville SC / May 12” at top, FORWARDED to Monk’s Corner with the CSA 12. Properly “Monck’s Corner” – today with a population of about 8,000, included without the Charleston-Summerville metropolitan statistical area. Ex Karrer $200. Keating Simons Ball (1818-1891) was a planter of Charleston District, S.C. Records of Comingtee, a Cooper River, S.C., plantation, in Charleston District (later Berkeley County), and other rice plantations of the Ball family, including Stoke, Kensington, and Midway. Much of the village of Pineville was burned in April 1865 by Union troops. CSA 11a-AD, 10¢ milky blue (4 large to huge margins) tied CHARLESTON / S.C. // AUG / 20 / 186_ (year date inverted) cds on commercially made cover to Miss Minnie Mordecai, Hon M. C. Mordecai, Columbia, S.C. On back flap are notes from Ashbrook and MacBride concerning the “broken E” of POSTAGE” – a constant variety that is not noted in catalog but should be. Ex Ashbrook, MacBride, Hubbell and Karrer. $250. Hon. Moses Cohen Mordecai (1804-1888), an importer of fruit, sugar, tobacco, and coffee, was Charleston’s most prominent Jewish citizen in the decades before the Civil War. Much more information on linked page. 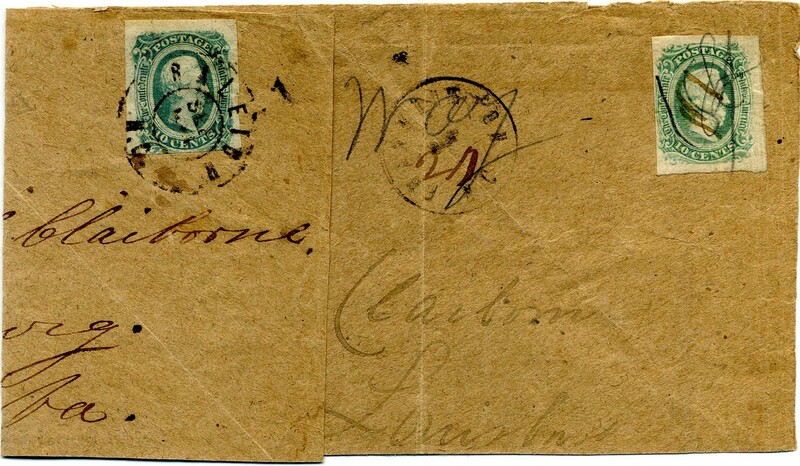 CSA 11-AD, 10¢ blue pair (gum stains and bit of vermin erosion) tied by CHARLESTON / S.C. // OCT / 2  dcds, Welch / Calhoun type A-28 with year eliminated – used only August 1864-January 1865 – on legal size cover to Clerk of the Court for Lancaster Dist SC Lancaster CHouse So with directive “Via Camden SC.” Docketing up right side “Returns of Elections for Senator Members of the House Representatives Ordinary – Tax Collector for Lancaster Dist SC – held at Fort Sumter.” Stamp selvage seals the intact back flaps. Ex Kohn and Karrer. $150. 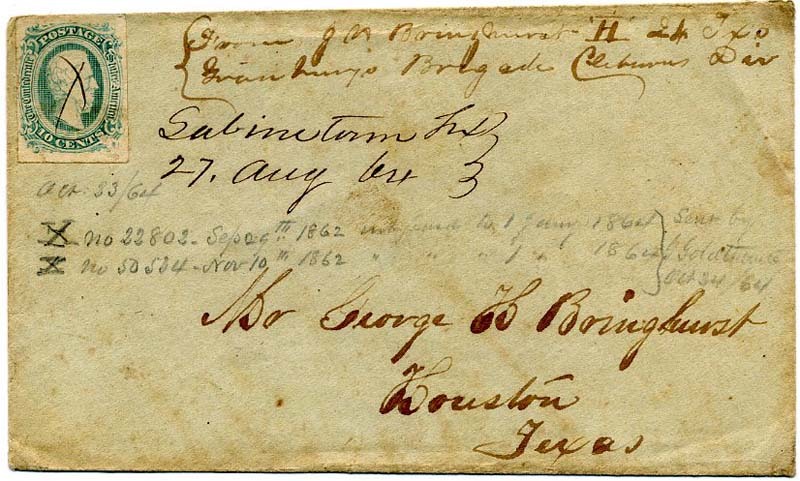 CSA 11, 10¢ blue (tiny scuffs) used with manuscript cancel of Sabinetown Tex / 27 AUG 64 on cover to George H. Bringhurst, Houston, Texas ,from soldier writing to his father with endorsement J. H. Bringhurst, Co. H. 24 Texas, Granbury’s Brigade, Cleburne’s Div. [1st Corps, Army of Tennessee] with contemporary pencil docketing. $575. Pvt. John Henry Bringhurst (1844-1890) was in Houston, Harris Co, Texas, in 1860. Born 11 February 1844 in Houston, Texas; died 3 Sep 1890, also in Houston. Married Jane Minerva Abercrombie. She filed a pension application in Harris County, TX #5119 per Information from Ancestry.com. His son of the same name was a respected engineer and Dean of Drexel Institute (now University), Philadelphia, as well as a professor at Johns Hopkins. The Bringhursts were descended from Leicestershire, England. Granbury's Texas Brigade, Cleburne's Division (1863 - 1865) was formed in November 1863 just before the battle of Missionary Ridge. Originally "Smith's Brigade" of Cleburne's Division, it was composed of three units. Much more information on linked page. 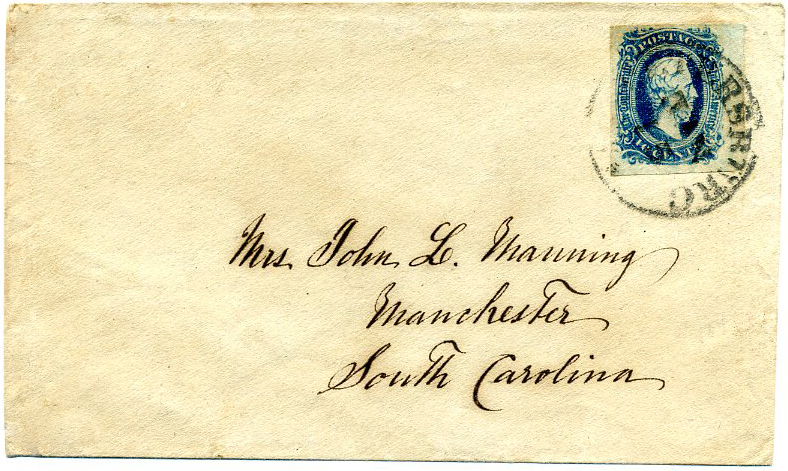 CSA 11-KB, 10¢ deep blue right sheet margin (4 margins) tied BLACK PETERSBURG / VA // JAN / 15  cds on cover to Mrs. John L. Manning, Manchester, South Carolina. The black Petersburg was only used from December 1864 to the end of the war. Lovely late in the war use. Ex Wiseman $200. Gov. John Lawrence Manning was a member of the Secession Convention and a signor or the Ordinance. During the early part of the war, he was a colonel on General Beauregard’s staff during the bombardment of Ft. Sumter and in Virginia during the early campaigns. Much more information on linked page. 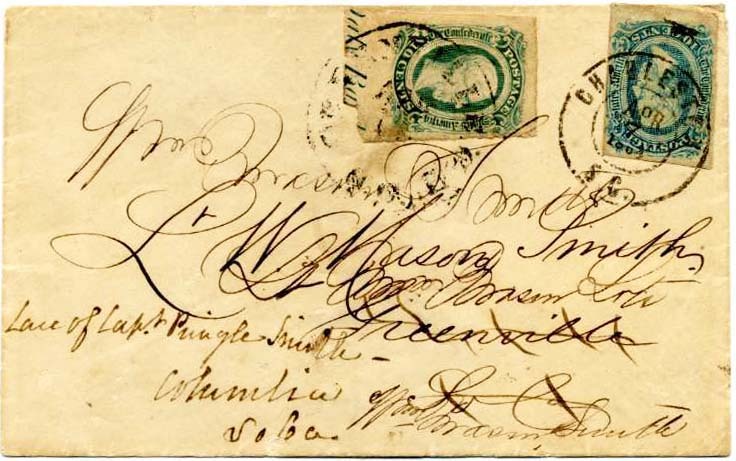 CSA 13d, 20¢ green diagonal bisect tied CHARLESTON / S.C. // OCT / 24 cds and grid on cover front only to John L. Faber, Winnsboro, South Carolina; other side bearing CSA 11-AD, 10¢ blue tied blue COLUMBIA / S.C. // OCT / 15 cds and addressed to Henry Horlbeck, Charleston, S.C. 1980 PF Certificate #82728, Ex Cantey. SAID TO BE THE ONLY RECORDED BISECT ON A TURNED COVER, to which I cannot attest but in any case is very rare and desirable. $3,900. CSA 11, 10¢ blue strip of four, uncanceled and without postal markings. 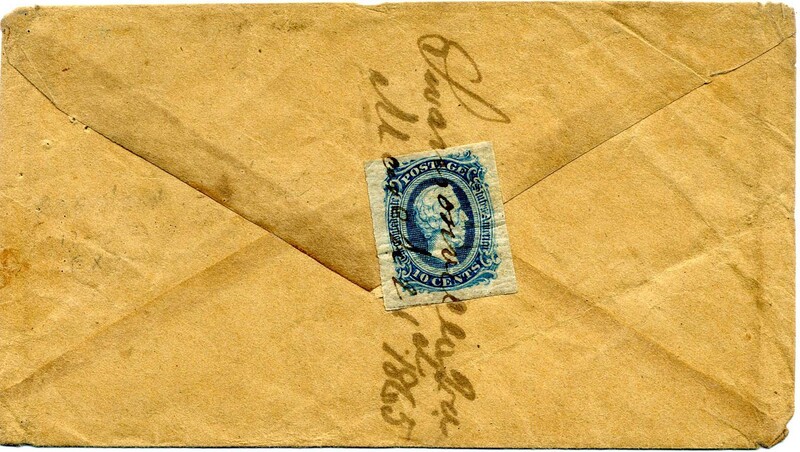 Stamps appear absolutely original to the WALLPAPER COVER (gold and white geometric leaf pattern) with period staining tying them to the cover. They were undoubtedly affixed to pay the TRANS-MISSISSIPPI RATE from Louisiana to Richmond, but were more likely carried by military courier. 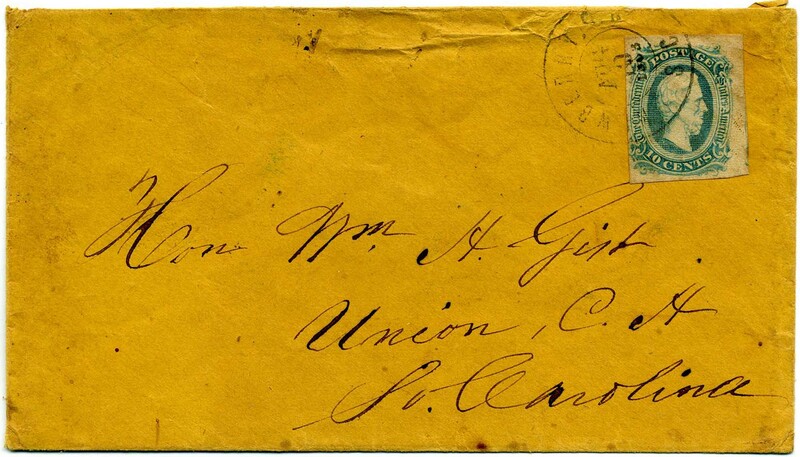 Cover is addressed to Col. H. M. Favrot, Superintendent army records for Louisiana, Richmond, Va. Care of Col. N. N. Galleher, Nachitoches [LA] Col. Galleher was a staff officer and Assistant Adjutant General for the Military Department of Arkansas and West Louisiana. This cover is listed as WS-1 in the 1984 monograph by Richard Krieger on Trans-Mississippi Mails. Ex Richey and Finney. Listed in both the Wallpaper and CSA 11 sections. $2,500. Capt. Henry M. Favrot was a captain of the "Delta Rifles," 4th Louisiana Infantry. Much more information on linked page. 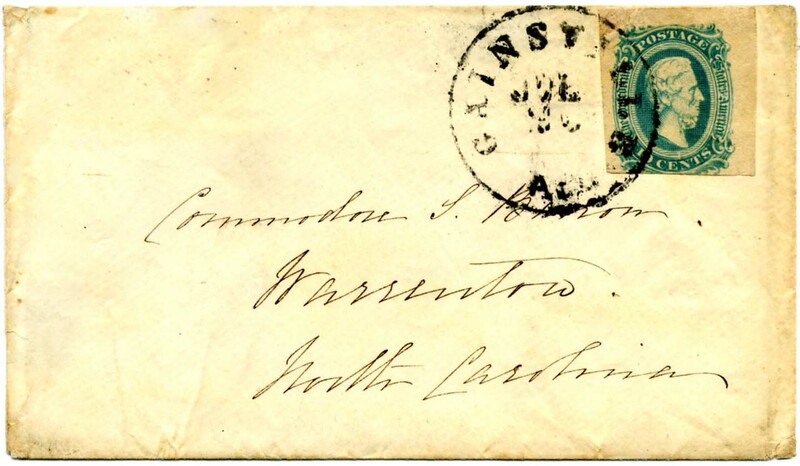 CSA 11c, 10¢ greenish blue (4 huge margins) tied neat CHARLESTON / S.C. // OCT / 21 / 1863, double circle on pristine blue commercially made cover to Wm Stevens Esqr, Lancaster CH, So Ca, with manuscript routing instructions at bottom left "C & So Ca RR" (Charleston & South Carolina Railroad, Superb, Ex-Brown, 2010 PF Certificate 483849. $250. CSA 11-KBb, 10¢ dark blue Keatinge & Ball printing tied Army of Northern Virginia field grid (CSA Catalog type ANV-11, CCV $175) on homemade cover to Mrs. Henry Tucker, Clinton PO SC in car[e] of Thos. Duckett. 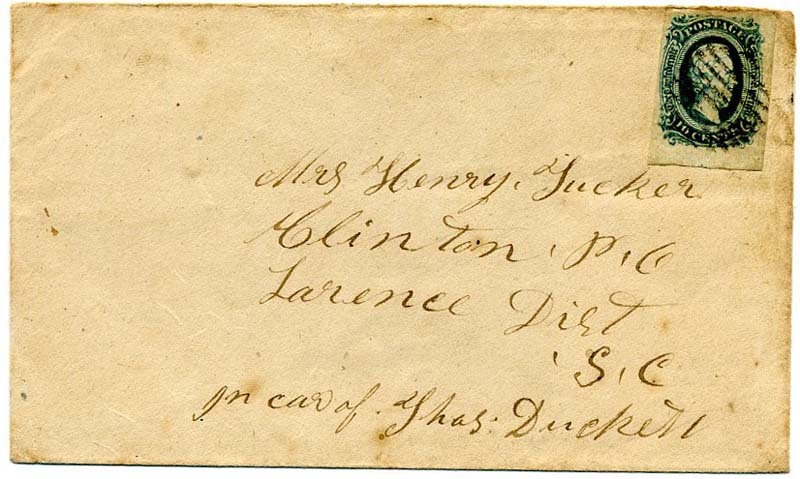 From other covers in this correspondence, it is known that this was sent by Private Henry Tucker, Co K, Hampton’s SC Legion Infantry to his wife. 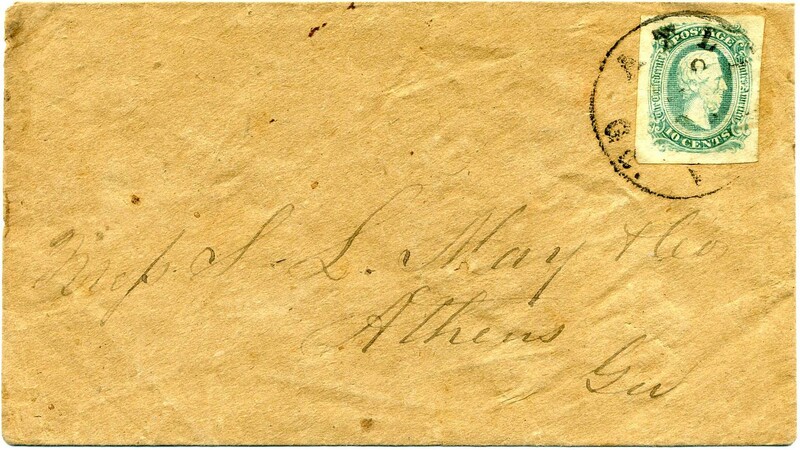 Both the KB stamp and use of this type grid dated this late in the war, January 1865 or later – General Fitzhugh Lee’s ANV Cavalry Division. $150. 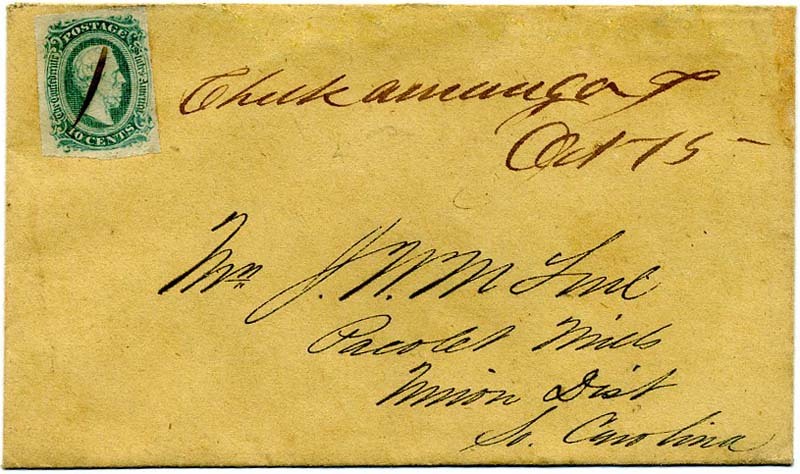 CSA 11, 10¢ blue (4 margins) used with manuscript cancel of Chickamauga T / Oct 15 to Mrs. J. W. McLure, Pacolet Mills, S.C. Professionally sealed edge tears across top, CSA Catalog Value $500. 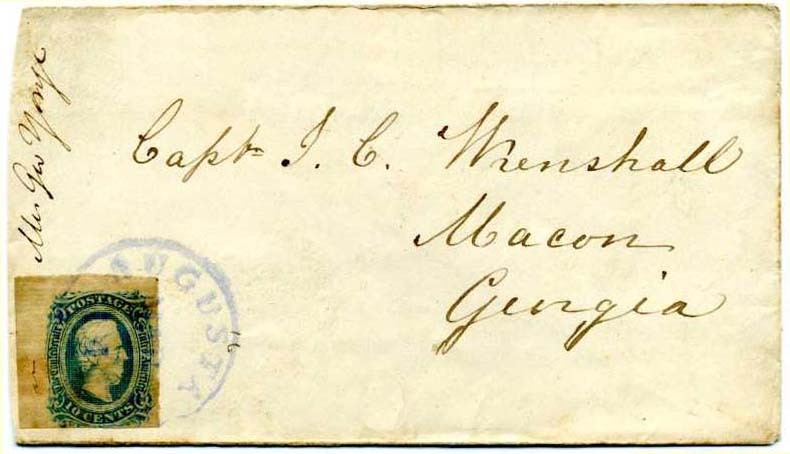 Classic Chickamauga Tennessee manuscript cancel from an ANV soldier. $450. William McLure was the Assistant Quarter Master of Co. M in the Palmetto Sharpshooters, Anderson’s, Jenkins Brigade, Army of Northern Virginia. 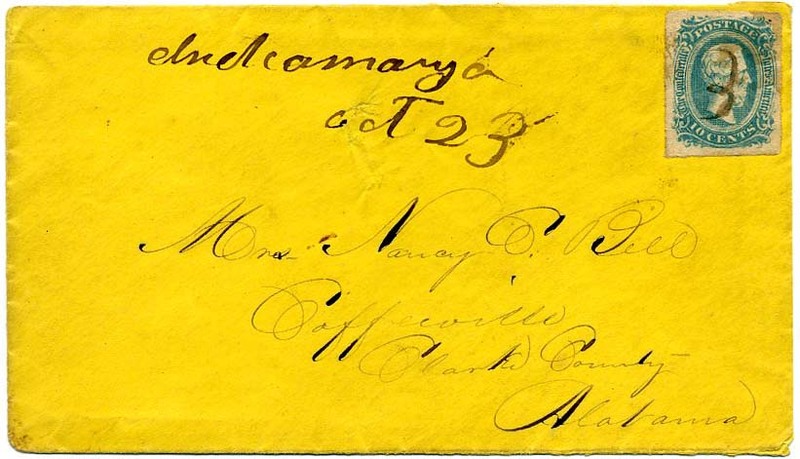 CSA 11a, 10¢ milky blue used with manuscript cancel of Chickamauga [Tenn] / Oct 23 on clean commercially made envelope to Mrs. Nancy E. Bell, Coffeeville, Alabama. $350. 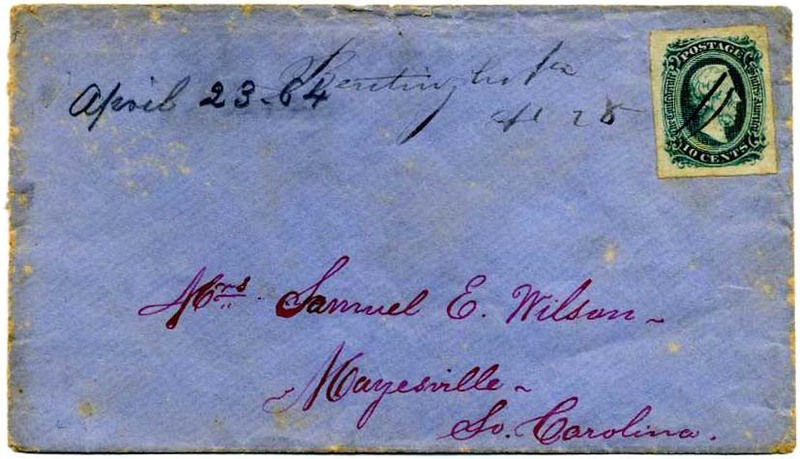 CSA 11, 10¢ blue (4 margins) tied ATLANTA / Ga. // JUN / 29 on commercially made cover to Louis Manigault, Care of Surgeon Joseph Jones, Box No 224 PO, Augusta, Georgia. $125. Dr. Joseph Jones (1838-1919) was a surgeon for the Confederate States of America (CSA) assigned to Surgeon General Samuel P. Moore to conduct medical studies of principal Southern hospitals and military prisons. Much more information on linked page. 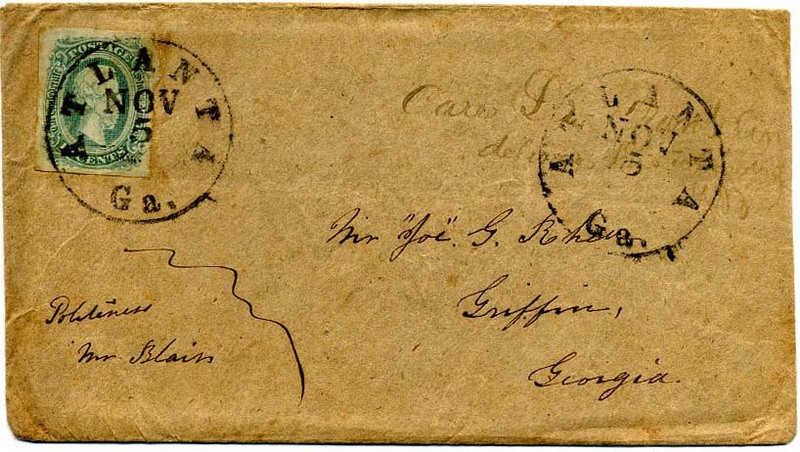 CSA 11, 10¢ blue (4 margins) tied bold strike of ATLANTA / Ga. // NOV / 5 cds on homemade TURNED COVER with second strike at right, addressed to “’Joe’ G. Rhin (? 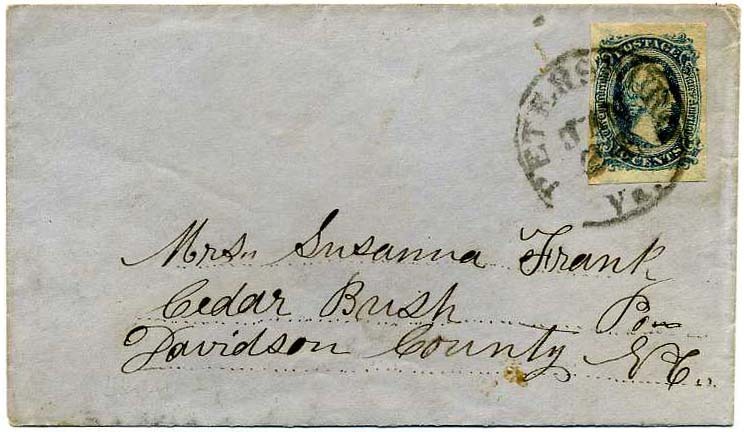 ), Griffin, Georgia”, with “Politeness Mr. Blair” at lower left and faded ink “care of” instructions under right postmark. 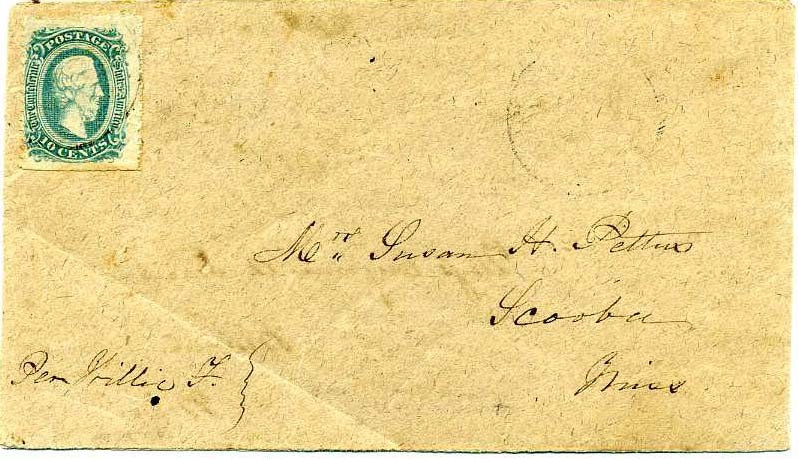 Inside is manuscript “Resaca Ga Oct 18” but no rate or stamp, addressed to J.J. Bell, Loudon, Tenn. $125. 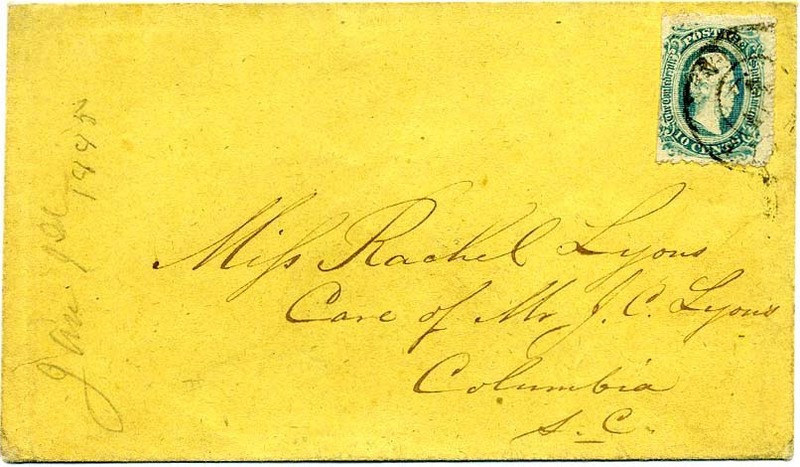 CSA 11e, 10¢ blue OFFICIALLY PERFORATED, straight edge at left faintest pre-use crease, tied with a double circle cancel, likely MOBILE / ALA, on cover to Miss Rachel Lyons, Care of Mr. J. C. Lyons, Columbia, S.C. 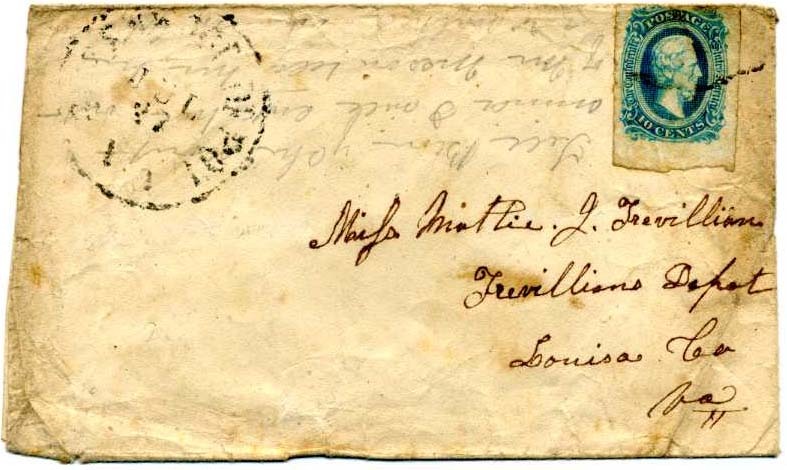 The likelihood is that this cover was from Dr. James Fountain Heustis of Mobile, Ala, who married Rachel Lyons on February 2, 1865. He served as surgeon and medical director in the Confederate Army. His medical practice before the war was in Mobile. He was a professor at the Medical College of Alabama. SCV $900. $500. CSA 11a, 10¢ milky blue with large to huge margins all around, tied upside at upper left of homemade cover by WASHINGTON / Ga. // JUN cds, addressed to [Capt] J. 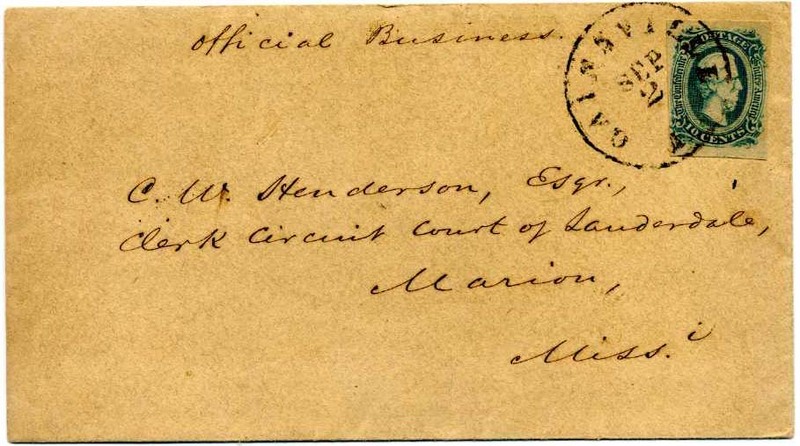 B. Fulton, Agent C.S.A., Greensboro, Georgia. 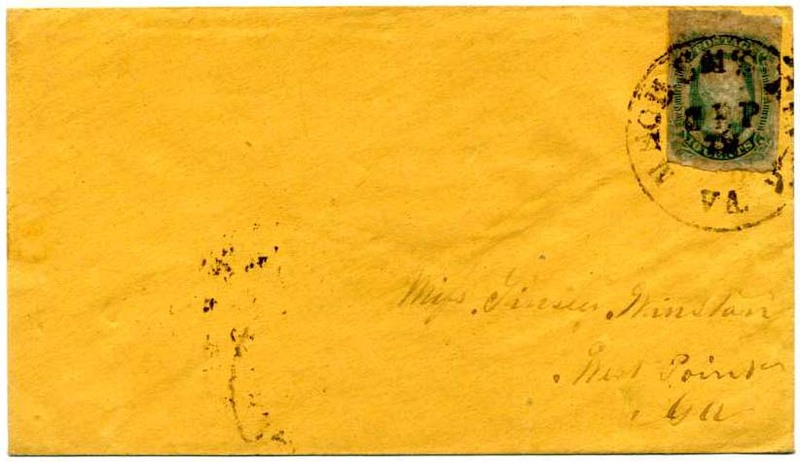 Van Dyk MacBride note on verso as “Superb!” $250. CSA 11, 10¢ blue tied neat clear VIOLET AUGUSTA GA cds on cover Miss Mary O. Tayloe Near Macon P.O., Marengo County, Alabama; docketing at left “E. 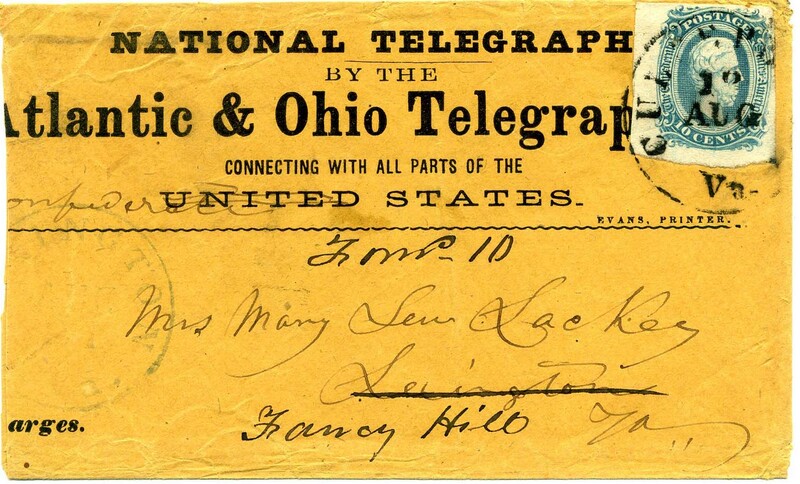 T. Tayloe, Feb 27th 1865, rec’d Mar. [27th], ans’d [March] 28th” - LATE USE near end of the war – this received just shy of Appomattox. Missing top flap and tiny tears at top. to SCV $225, CCV $360. $250. CSA 11-AD, 10¢ blue (3 large to huge margins) tied with neat GAINSVILLE / ALA // JUL cds on cover to Commodore S. Barron, Warrenton, NC; Nice CSA Navy related item; top back flap partially missing. $130. Commodore Samuel Barron had an illustrious naval career beginning at the incredible age of SIX (not a typo – the youngest person ever commissioned to the US Navy). More information on linked page. CSA 11-AD, 10¢ blue just tied MOBILE / ALA double-circle cancel on TURNED COVER to “Mr. E.R.A. Smith, Co D 3 Ala. Reserves, Selma, Ala;” inside use is a manuscript “Pd 10” with no town cancel, to “T.T. Smith, Co I, 2nd Regt of Ala. Reserves”, bit of edge wear across top of cover and stamp. Elijah R. A. Smith enlisted as a private, no other info’ of note. DOUBLE MILITARY ADDRESSES. $130. 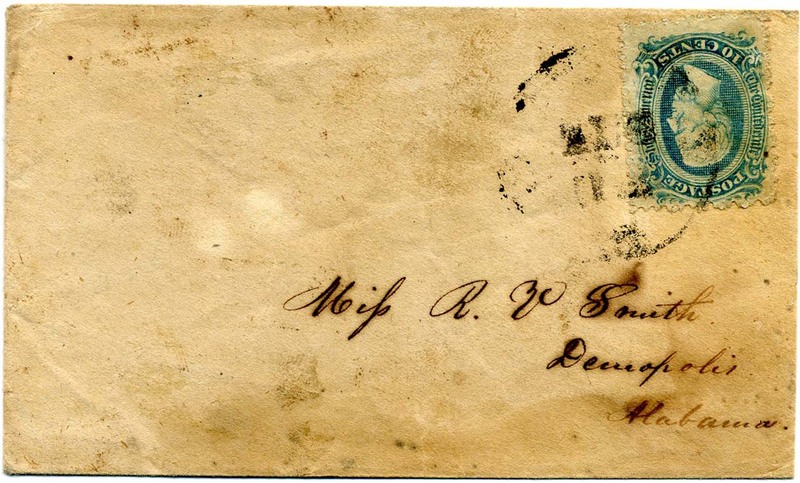 CSA 11-ADc, 10¢ bluish green (pre-use upper corner creases) used with Army field cancel on cover to Mrs. Sarah E. Mize, Berea PO, N.C.; needs research on soldier to determine which NC Mize, as there are dozens. $90. 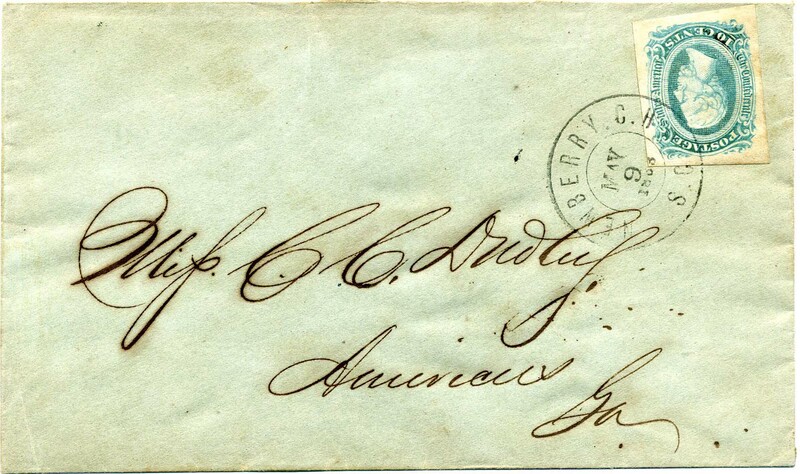 CSA 11-AD, 10¢ blue (4 huge margins) tied scarce ARMY OF TENNESSEE FIELD CANCEL, CSA Catalog ATN-04 cancel (used in 1865), on cover to “Mr. Alixander Kenedy Pollard, Alabama.” Soldier research left to those with more time than I. Slightly reduced at top and a bit rumpled. $140. 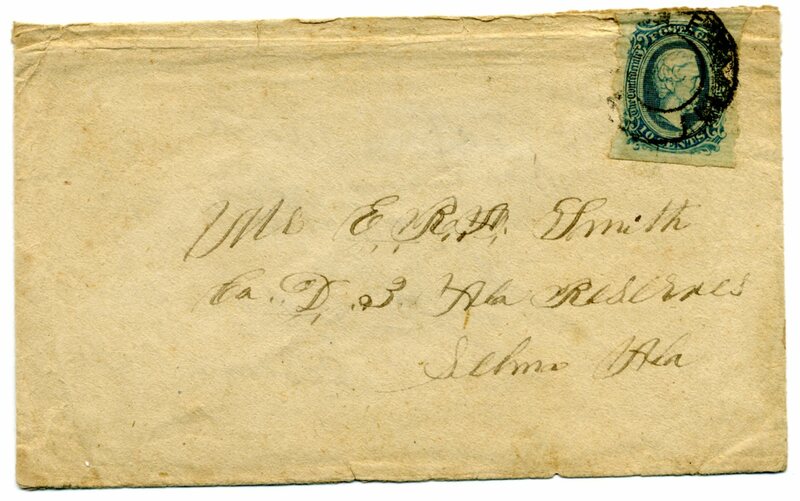 CSA 12-KB, 10¢ deep blue (4 huge margins – superb) tied on back flaps of homemade cover with “Swansonville Va. March 21st 1865” manuscript cancel – miraculously, the stamp was not torn upon opening, although it was thinned. 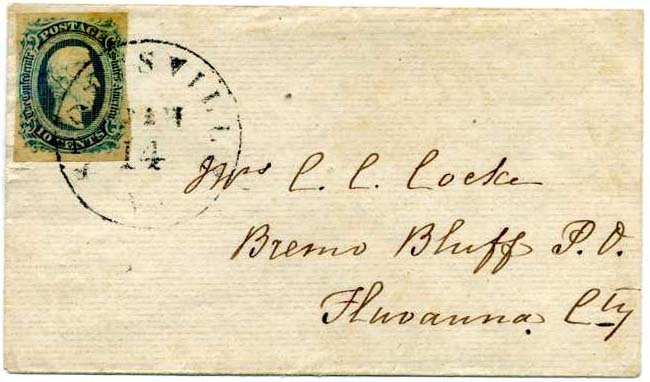 Obverse addressed to “Lieut. Joseph B. Dickinson, Cumberland C.H., Virginia.” USE VERY LATE IN THE WAR – only two weeks before surrender – catalogs much higher than normal dated use. CCV $360. $400. Joseph Bell Dickinson (1829-1886) resided in Cleek’s Mill, Bath County, VA, when he enlisted as a private in Co. F, 11th Virginia Cavalry. CSA 11-KB, 10¢ bright blue (4 ample to huge margins showing part adjacent stamp at right) tied beautifully struck ATHENS Ga / PAID // MAR / 17  cds, CSA Catalog Value $450 owing to the LATE DATE but a few scant weeks before Lee’s surrender and after Sherman’s March to the Sea through Georgia. 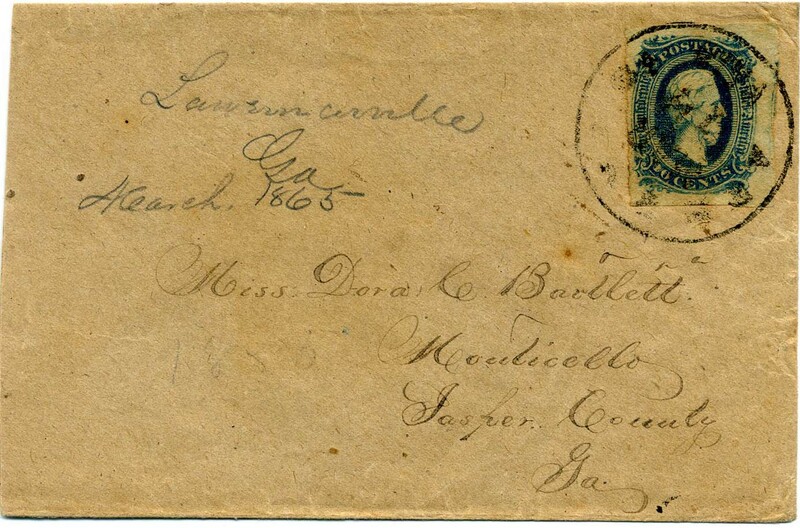 Docketing in pencil “Lawrenceville, Ga March 1865” on cover to Miss Dora C. Bartlett, Monticello, Jasper County, Ga. Slightly reduced at left. $350. 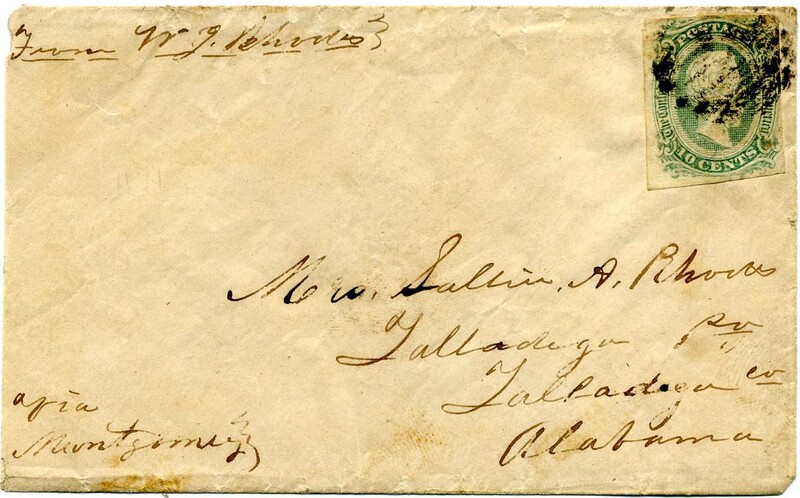 CSA 11a, 10¢ milky blue top sheet margin single (pre-use creases) tied ATLANTA / Ga // JUN / 15 cds on cover to Lt. A. J. Locke, Commanding Lake Squadron, ?, Ala. with ridiculing “return address” at top “From J. M. deLacy, Chf Convoy to his Excellency Abe Linkun Esq Vs His Majesty Henry Ward Beecher Stowe alias Mdmssl Harriet Beecher Stowe.” While somewhat foxed / stained with a bit of address ink erosion, this is an exceptional mocking piece of postal history. Ex Cox. $300. Harriet Beecher Stowe wrote Uncle Tom’s Cabin, one of the precipitating factors of the Civil War. Detailed explanation of the cryptic scribbles on the cover are explained on the linked page. CSA 11-KB, 10¢ deep blue (4 large to huge margins) used with manuscript “Black Walnut Va. March 16, 65” to clean homemade cover to Charles Stebbins, No 117 Broad Street, Richmond, Va. Wonderful back story and LATE USE ONLY A FEW WEEKS BEFORE LEE’S SURRENDER. CCV of such late use is $450. Ex Cox. $450. Extensive information on Black Walnut Plantation on linked page. 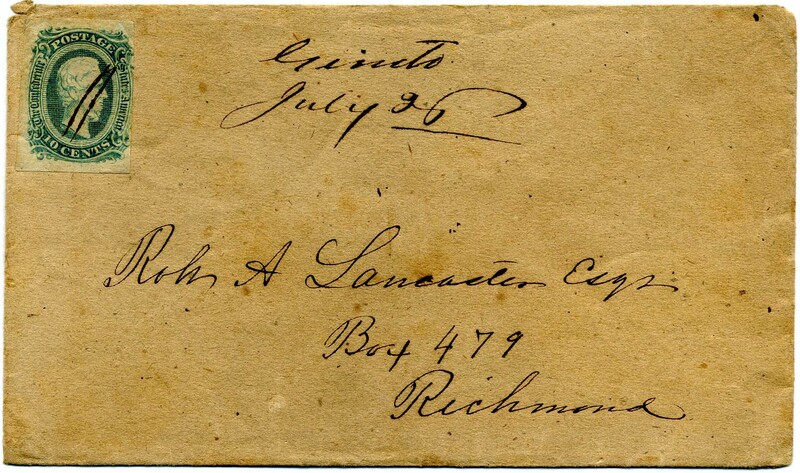 CSA 11-AD, 10¢ blue (3 large margins) used with manuscript cancel of “Genito [Va] July 26” on clean homemade cover to Robt A. Lancaster Esqr, Box 479, Richmond. 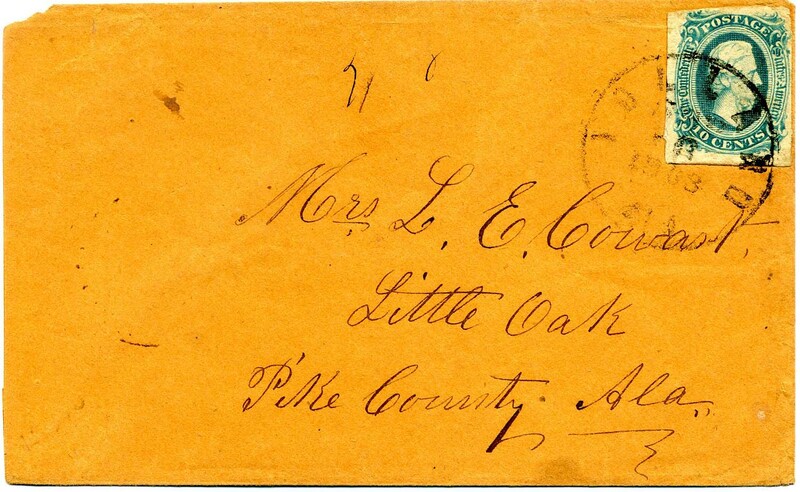 Nice small town manuscript postmark from town that is now an incorporated community in Powhatan County, Va. Ex Cox. $90. 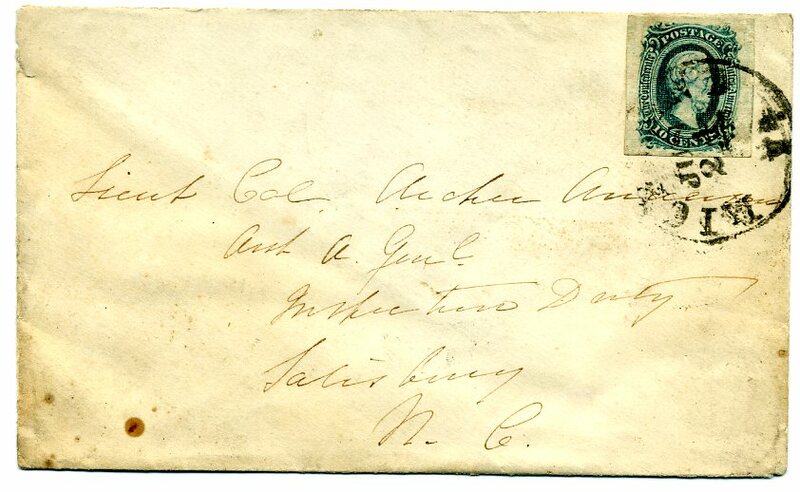 CSA 11-ADc, 10¢ greenish blue with gum residue all around stamp on the cover (no doubt added their own since that on the stamp would not adhere properly, a common problem), tied neat dateless cds of DUBLIN / VA on clean commercially made cover to Mrs. C. R. C. Minor, Hewlett’s PO, Va Centl R.R., Ex Cox. $120. 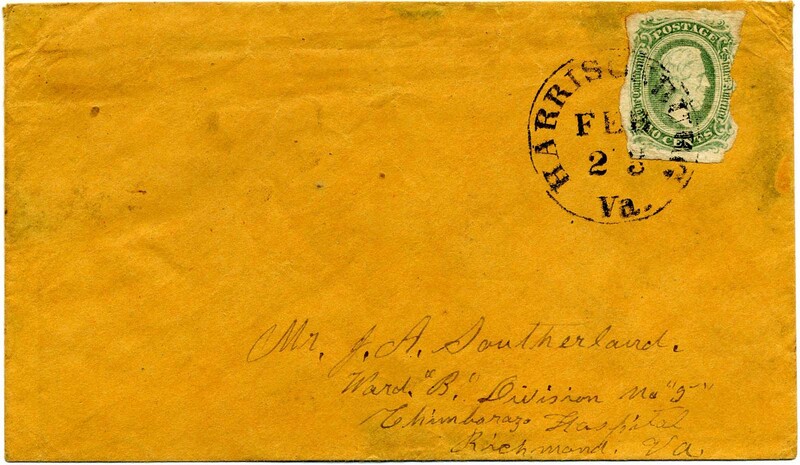 CSA 11-ADd, 10¢ green (irregular margins) tied neat HARRISONBURG / Va. // FEB / 23 cds on cover to J. A. Southerland, Ward “B” Division No. 5, Chimborazo Hospital, Richmond, Va. SCARCE SHADE. Ex Cox. $300. John Southerland served in Virginia Price’s Heavy Artillery and Co. B, VA 18th Battalion Heavy Artillery. Much more information on linked page. 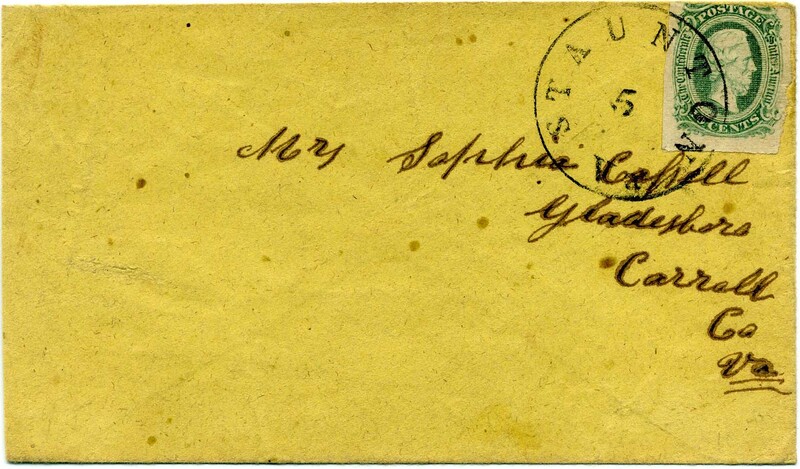 CSA 11-ADd, 10¢ green (3 margins) tied neat STAUNTON / Va. // 5 (no month) cds on yellow homemade cover to Mrs. Sophia Cassell, Gladesboro, Carroll Co, Va. Ex Cox. SCARCE STAMP SHADE. $300. Sophia Yonce Cassell (1825-1906) was the wife of James L. Cassell (1825-1885). James enlisted 21 Feb 1863 as a private in Co. E, VA 17th Infantry and was transferred in December to Co. C, VA 51st Infantry. 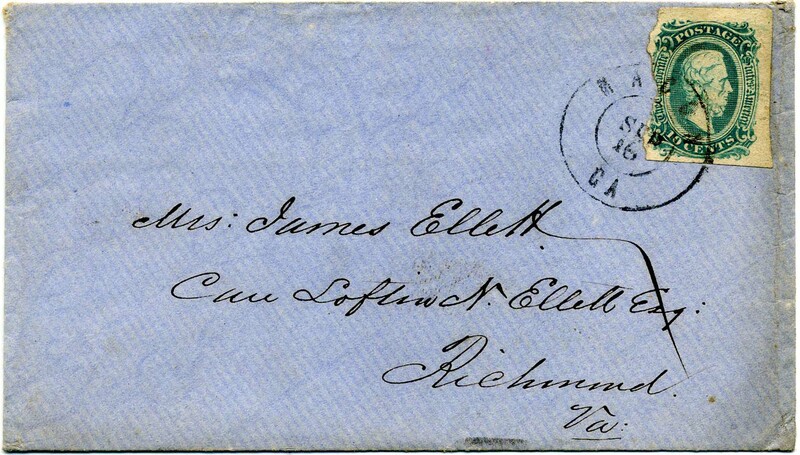 CSA 11, 10¢ blue (into at LL) tied neat MACON / GA // SEP / 16 double circle datestamp on fresh blue laid paper/watermarked commercially made cover to Mrs. James Ellett, Care Loftwich N. Ellett Esq, Richmond, Va. Ex Cox. $110. James M. Ellett served in Co. C, VA 10th Battalion Heavy Artillery and Co. D, Confederate 1st Engineers. Much more information on linked page. 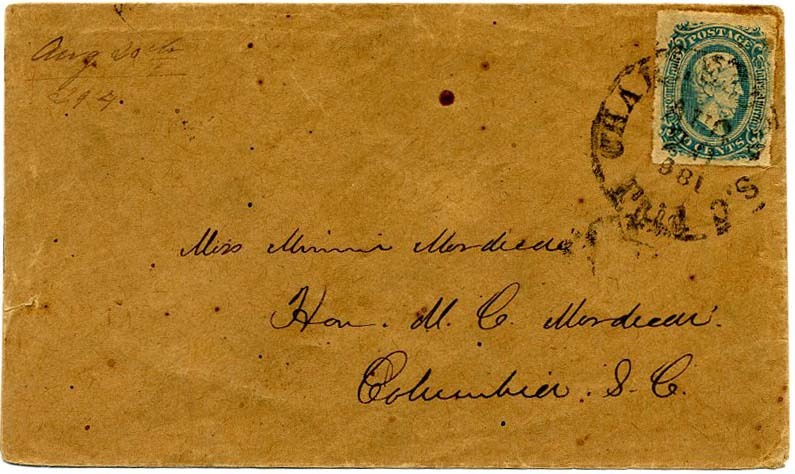 CSA 11e, 10¢ blue OFFICIALLY PERFORATED 12 ½ tied COLUMBUS GA. // DEC / 13 cds on clean commercially made cover to Mrs. Gardner, Hatchachubee, Russell Co, Alabama. Plantation Collection. SCV $900. $700. CSA 11-KB, 10¢ deep blue Keatinge & Ball (4 margins with usual gum stains) tied by CHARLESTON / S.C. cds on cover to Mrs. Edgar M. Lazarus, Hon M. C. Mordecai, Columbia, S.C.; Plantation Collection. SCV $200. $200. Hon. Moses Cohen Mordecaiwas Charleston’s most prominent Jewish citizen. Much more information on linked page. 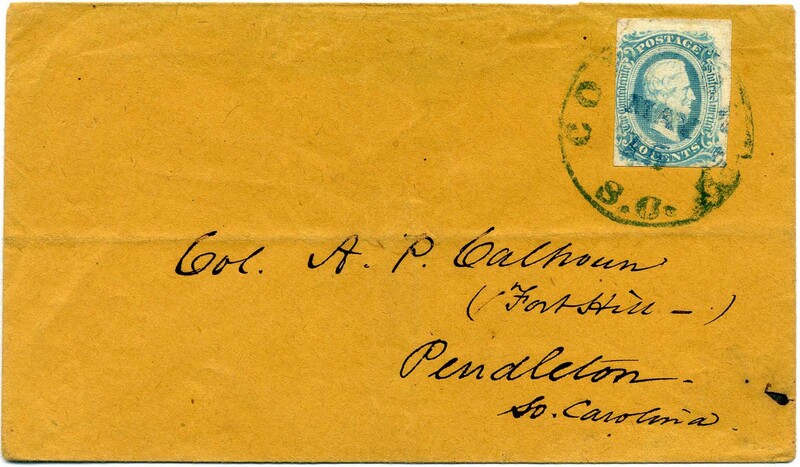 CSA 11, 10¢ blue (small sealed corner tear) tied neat blue COLUMBIA / S.C. // MAY / 15 cds on cover to Col. A. P. Calhoun (Fort Hill), Pendleton, So. Carolina; horizontal file fold and part of top back flap missing. Plantation Collection. $125. Andrew Pickens Calhoun was son of John Calhoun. Much more information on linked page. CSA 11, 10¢ blue tied by POLLARD / ALA cds on cover to Mrs. L.E. Cowart, Little Oak, Pike County, Ala.; slightly reduced at left with UL cover corner bit rounded. The Cowart family moved to Pike County in 1839. The initials H.D.C. on verso which are likely Hansford Duncan Cowart (1818-1890). L.E. Cowart was doubtless Louisiana Emeline “Ninnie” Cowart (1820-1909), wife of H.D. Cowart. H.D. Coward served in Co. A, Alabama 57th Infantry, Army of Tennessee. Plantation Collection. $125. 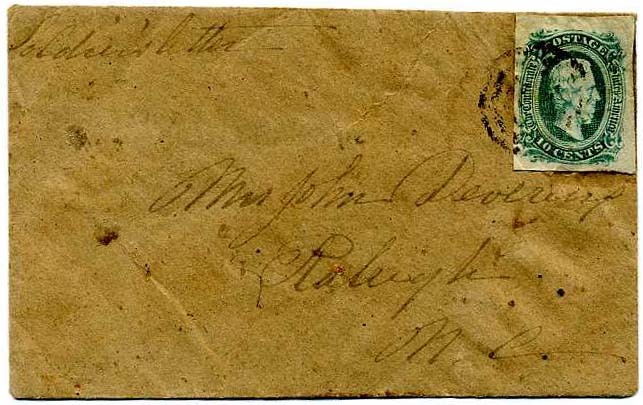 CSA 11-ADc, 10¢ bluish green tied RICHMOND / Va. // MAR / 28  cds on cover to Miss Mary B. Cocke, Belmead Mills, Powhatan County, Va., with docketing at left end “Received April 5, 1865” – four days before the surrender and 3 days after the fall of Richmond. 1977 CSA Certificate signed by Morris Everett. Damage at top right into right stamp edge, gum stains, part of top back flap missing. RARE THIS LATE. CSA Catalog assigns a 200% premium for such late dates. Ex Tom Jackson and Plantation Collection. $230. The Cocke family of Virginia goes back to the Revolutionary War. More information on linked page. 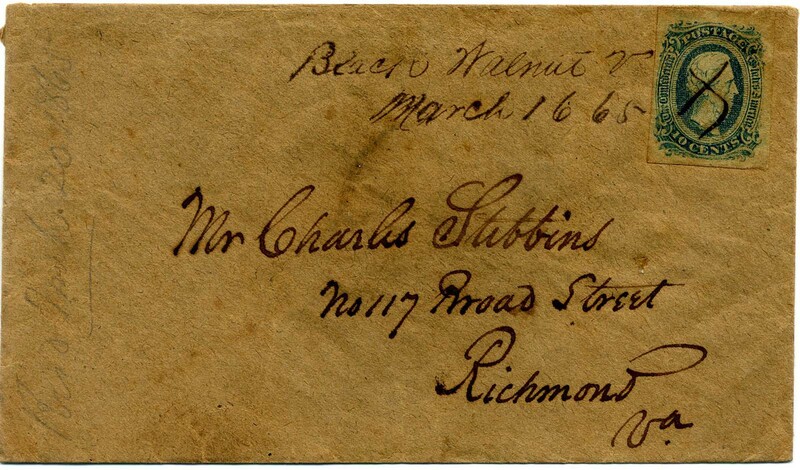 CSA 11-ADc, 10¢ bluish green (large margins all around) tied RICHMOND / Va. // JUL / 3  cds on cover to Mrs. A. L. Rives, Cobham Depot, Va. C. 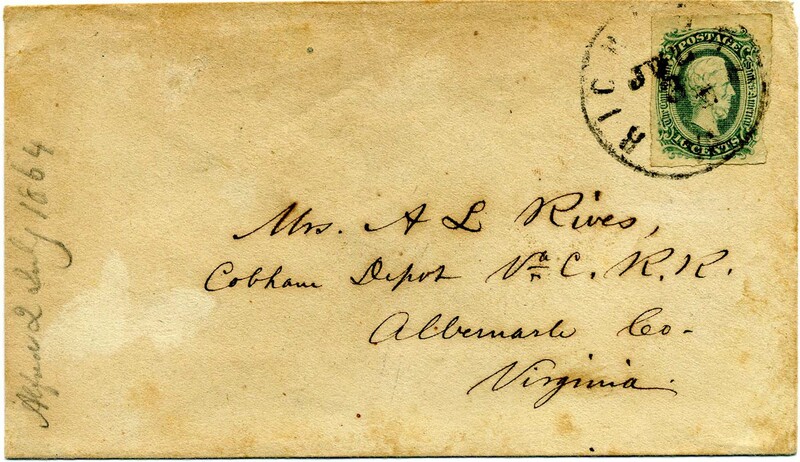 R.R., Albemarle Co, Virginia, with pencil docketing across left end “Alfred 2 July 1864” Plantation Collection. $200. Alfred Landon Rives was the son of William Cabell Rives, both distinguished in their own right. Much more information on linked page. 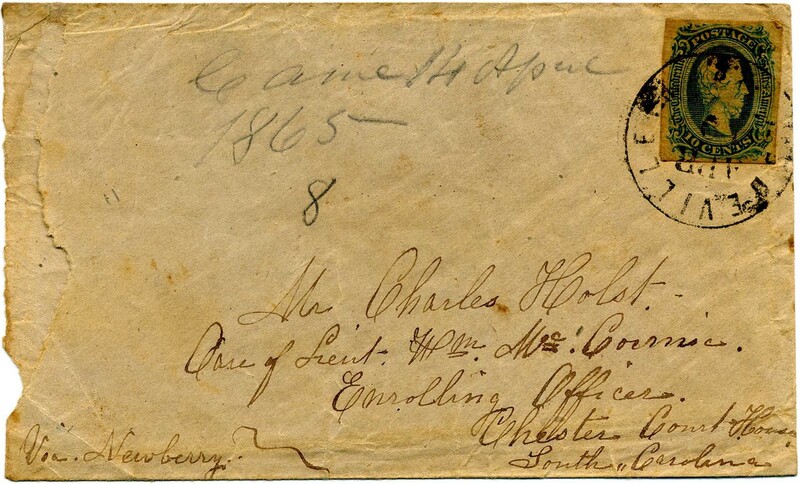 CSA 11-KB, 10¢ deep blue tied HARDEEVILLE / S.C. // APR / 10  on homemade cover to “Charles Holst, Care of Lieut. Wm. 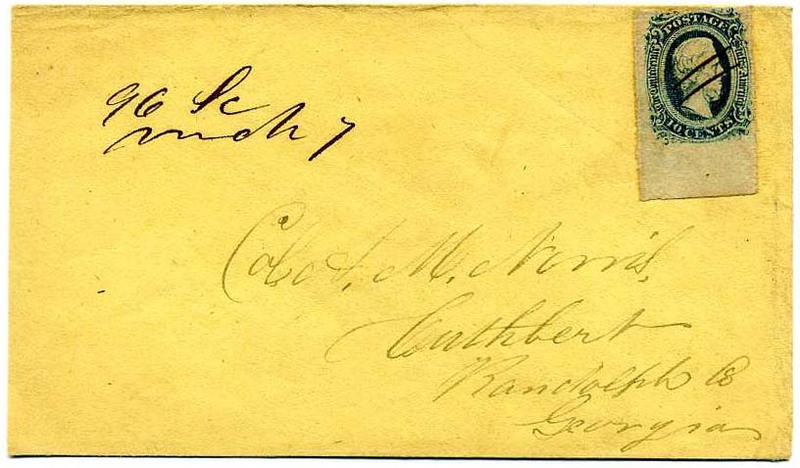 McCormic[k], Enrolling Officer, Chester Court House, South Carolina,” and manuscript directive at lower left, “Via Newberry.” with pencil docketing, “Came 14 April 1865.” Roughly opened at left. VERY LATE USE the DAY AFTER LEE SURRENDERED. CCV $360. $350. William R. McCormick was a 2nd Lieutenant in Co. A, SC 5th Infantry, Jenkins / Bratton’s Brigade, Field’s Division, 1st Corps, Army of Northern Virginia. 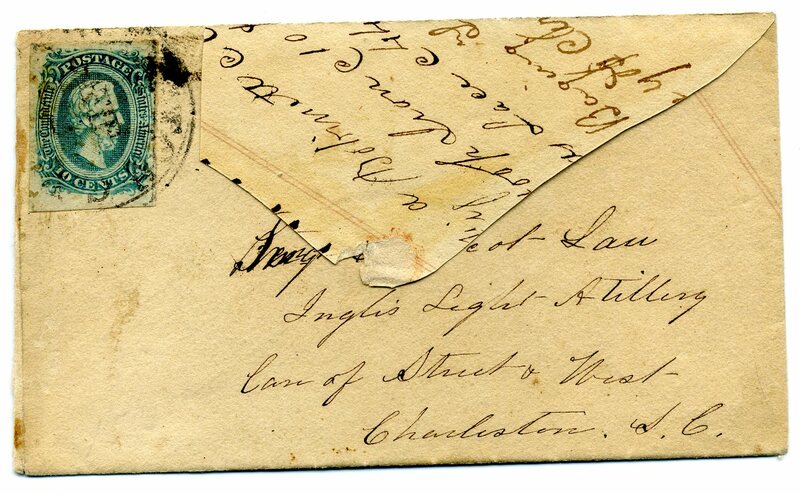 CSA 11-AD, 10¢ blue (4 margins, clear to large) tied unidentified cds on adversity cover made from iron processing invoice, addressed to Sergt C. Bacot Law, Ingle’s Light Artillery, Care of Street & West, Charleston, S.C. Cyrus B. Law served in Company D, SC 2nd Light Artillery, Department of South Carolina, Georgia and Florida. $170. CSA 11-ADa, 10¢ milky blue pair (3 margins) tied CULPEPER C.H. / Va. // JUL / 21  cds on fresh cover to Miss Fannie Ridley, Jerusalem, Southampton, Virginia/ [care of] Col. Ridley; slightly reduced at right. $250. 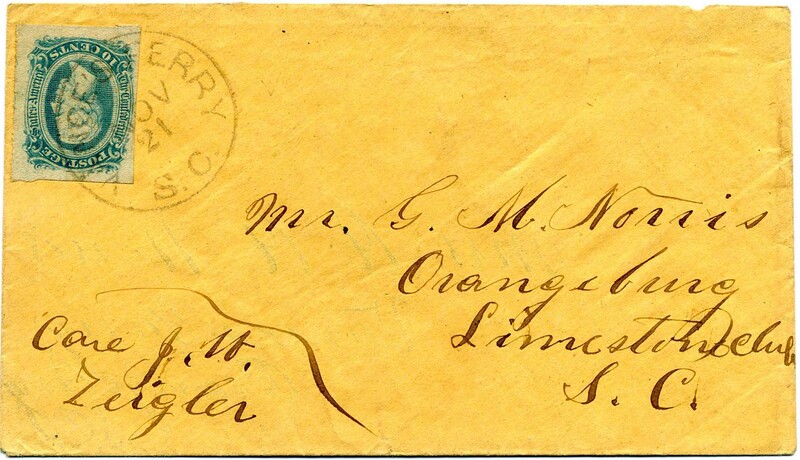 CSA 11-AD, 10¢ blue (4 ample to huge margins) tied neat clear VANCE’S FERRY / S.C. // NOV / 21 cds on clean TURNED COVER to G. M. Norris, Orangeburg, Limestone Club, S.C., Care J. H. Zeigler; inside use with stamp missing, addressed to Mrs. A. A. Norris, Vance’s Ferry, SC. Very Fine. $220. CSA 11, 10¢ dark blue (4 large margins) tied at top with grid which, at first, smells like an Army of Northern Virginia field cancel but can’t find a listed one to match up. 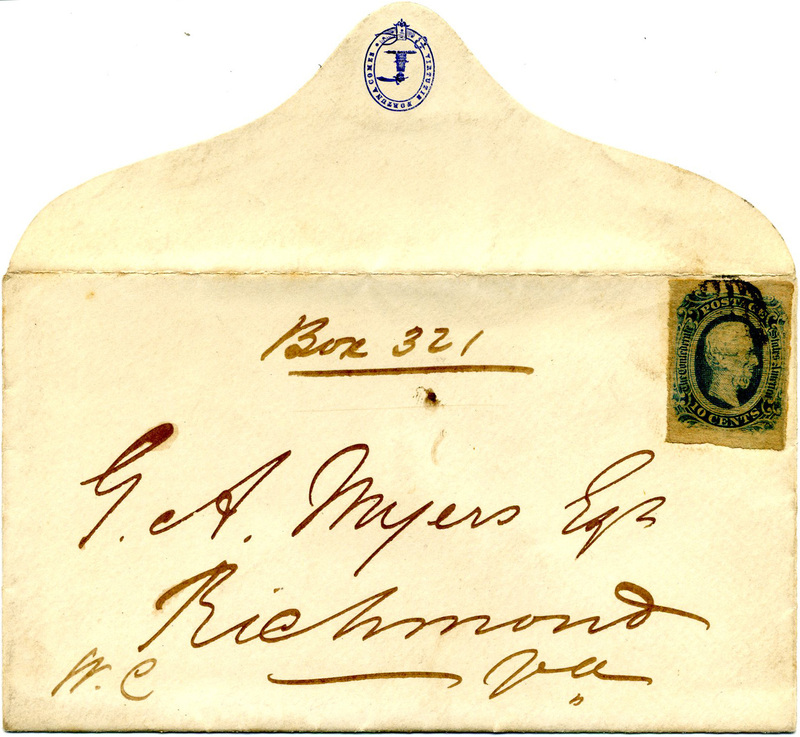 Addressed to G[ustave] A[dolphus] Myers, Esq, Richmond, Va. with initials “W.C.” at lower left. “Box 321” at top. 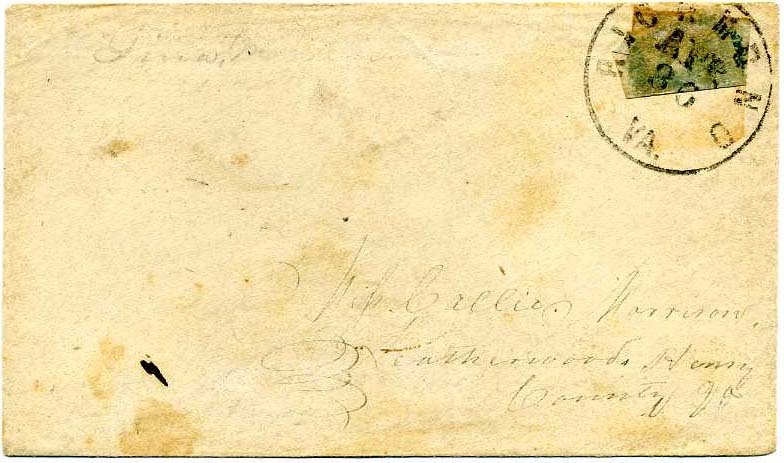 British envelope is commercially made laid paper with imprint under flap of “Partridge & Cozens, 192, Fleet Street” (British quality stationers) with beautiful blue embossed flap tip “Virtutis Fortuna Comes,” Offset of a circular datestamp on verso as well. Speculation email between Kaufmann and Walske that this could be a hand-carried blockade cover (known Bermuda-run correspondence) but there is no proof. Interesting and attractive mystery cover! $325. 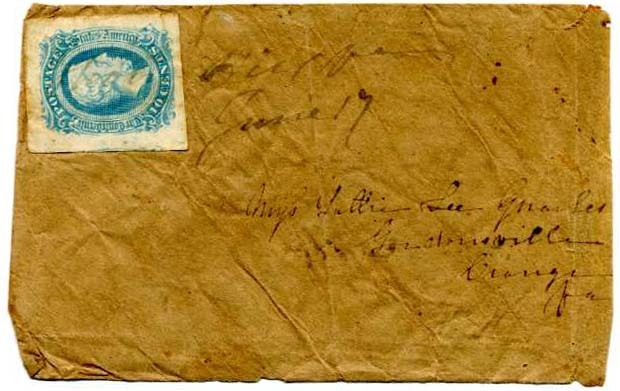 CSA 11, 10c blue, right sheet margin copy roughly torn away at top apparently pre-use, with heavy homemade adhesive all around, tied with manuscript cancel of “Mars, Ala, Aug 9.” Non-contemporary but old “1, 1861” to the right (which is not correct as stamp was not issued until 1863). 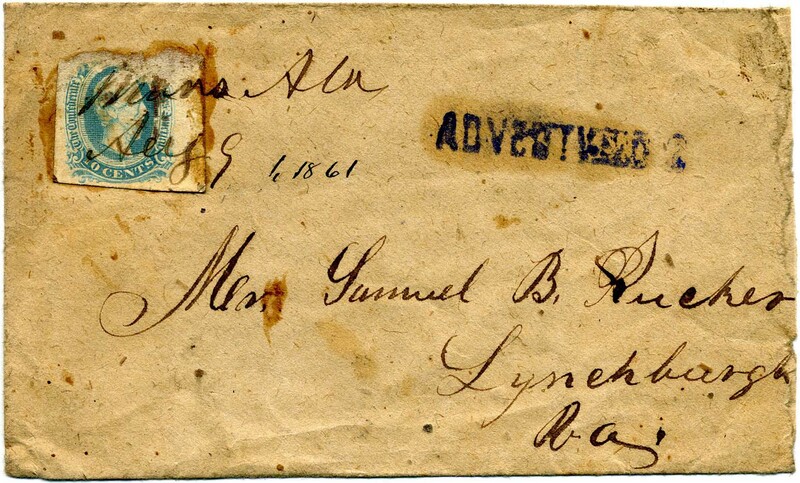 Addressed to Samuel B. Rucker, Lynchburg, Va. with bold violet ADVERTISED 2 (CSA Catalog Type K with CV $500) at top right and matching violet LYNCHBURG / VA // SEP / 1 backstamp. Roughly opened at right and slightly reduced. Scarce use. $375. 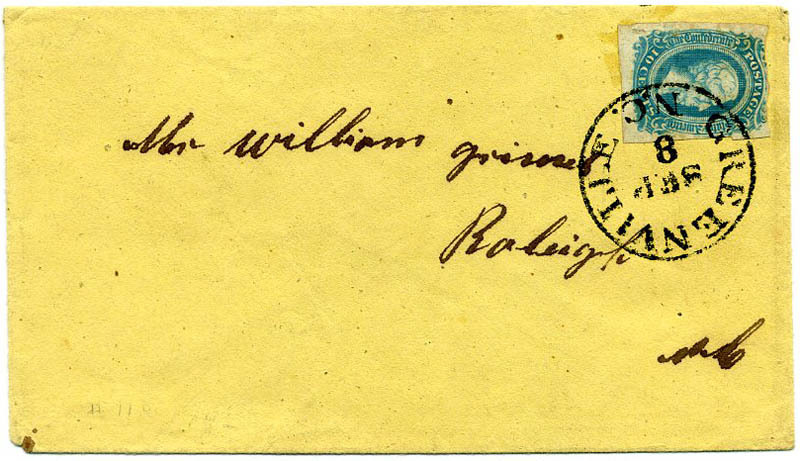 CSA 11, 10¢ light blue used on pristine cover with manuscript cancel and “Official Business” at top right, addressed to Colonel J[acob] Schmitz, Cmdg 1st Regt. 31st Brigade, Texas State Troops. $200. 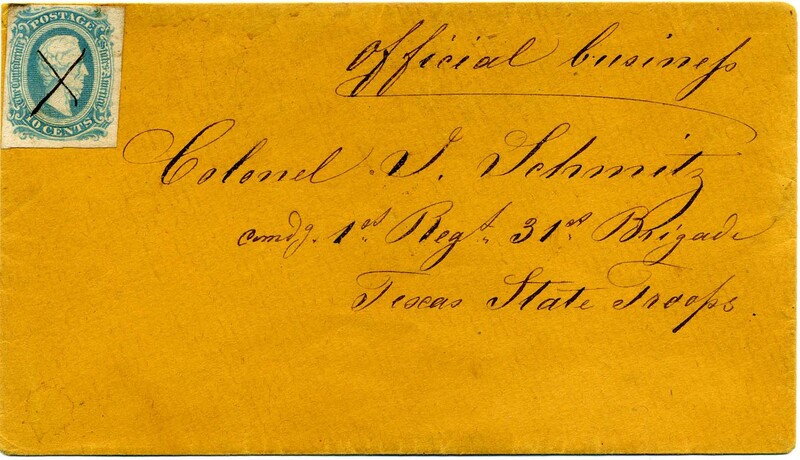 Col. Jacob Schmitz, commanded 1st Regiment, Comal County, 31st Brigade, Texas State Troops (TST) FRONTIER REGIMENT / FRONTIER ORGANIZATION. Much more information on linked page. 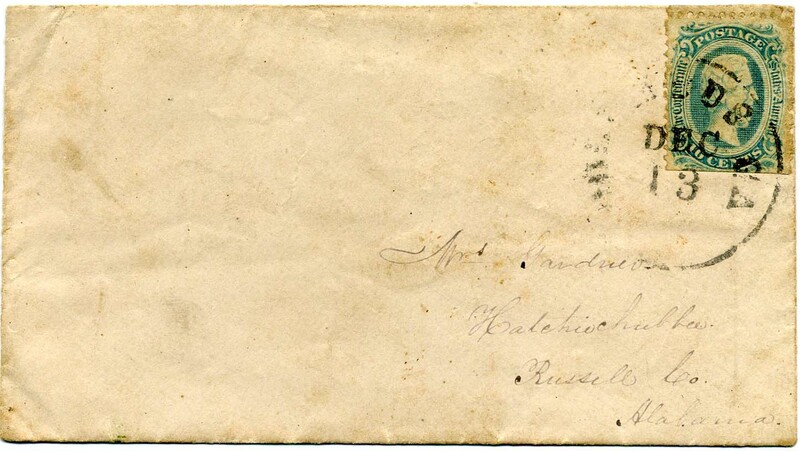 CSA 11, 10¢ blue tied neat CHARLESTON / S.C. // APR / 7 / 1864 dc on cover addressed to Wm. Mason Smith, Greenville, So. Carolina, where it was FORWARDED with CSA 12c, 10¢ greenish blue bottom sheet margin imprint copy show [D]aly Ban[k Note Engravers, Richmond, Va] tied GREENVILLE / S.C. cds to Care of Capt. Pringle Smith, Columbia, So. Ca. ; lots of name doodling on back, Very showy cover. $425. The Smith family were Southern aristocracy (Smithfield Plantation). Information on linked page. CSA 11-AD, 10¢ blue, tied NEWBERRY C.H. 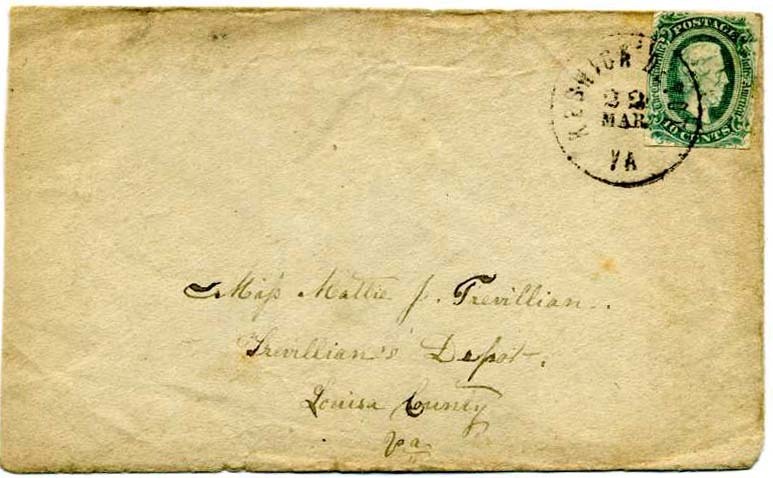 / S.C. // AUG / 10 /1863 double circle datestamp on TURNED COVER to Hon. Wm. H. Gist, Union C.H., SC; inside use GREENVILLE C.H. / S.C. cds and PAID 10 (CSA Catalog Type A, CV $200) to R. Stewart, Newberry, SC; sealed tears at top through markings. Ex Wayman. $180. William Henry Gist was the 68th Governor of South Carolina from 1858-1860 and a leader of the secession movement / signer of the Ordinance of Secession. Much more information on linked page. CSA 11a, 10¢ milky blue with 4 huge balanced margins, tied NEWBERRY C.H. 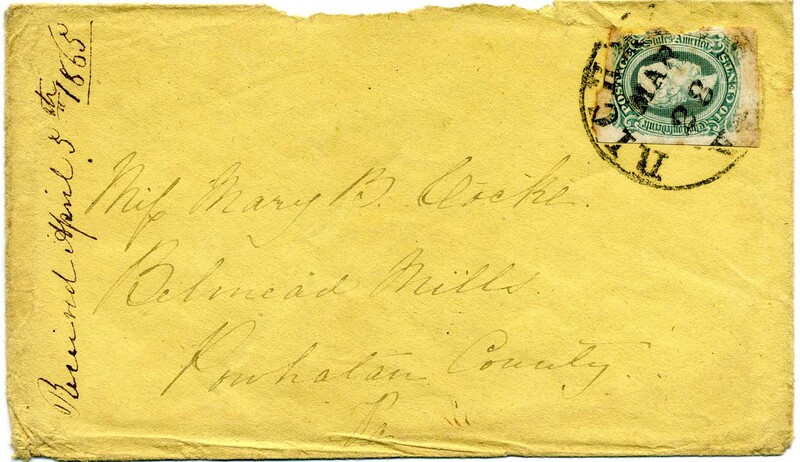 / S.C. // MAY / 9 / 1863 double circle datestamp on pale green homemade cover to Miss C. C. Dudley, Americus, Ga., Ex Wayman. $200. CSA 11-ADa, 10¢ milky blue used over 3¢ star-die entire, tied by light VIOLET PENDLETON / S.C. // JUN / 12 cds, to Mrs. Chas. 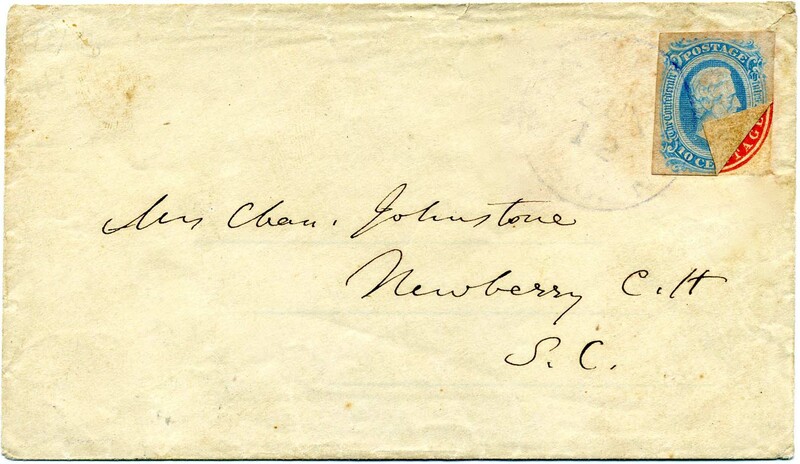 Johnstone, Newberry C.H., S.C.; only 5 confederate post offices occasionally used this color. 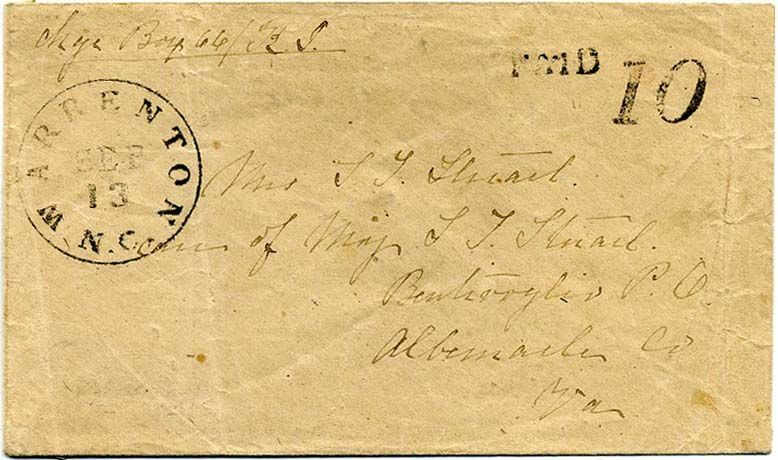 This is an adversity use of the envelope, as they were demonetized in August 1861 by the USPOD, Ex Wayman. $375. CSA 11-AD, 10¢ blue (faulty) tied by badly worn Army field cancel that has become little more than a smear. Addressed to “Mrs. Rebeca Peterson, Chappells P.O., G.&C.R.R., South Carolina, in care of Peterson Mail.” Opening tears across top and upper right around stamp. PETERSON’S PACKAGE OR PETERSON’S MAIL is a known but, as far as I am aware, an unresearched regional mail service. 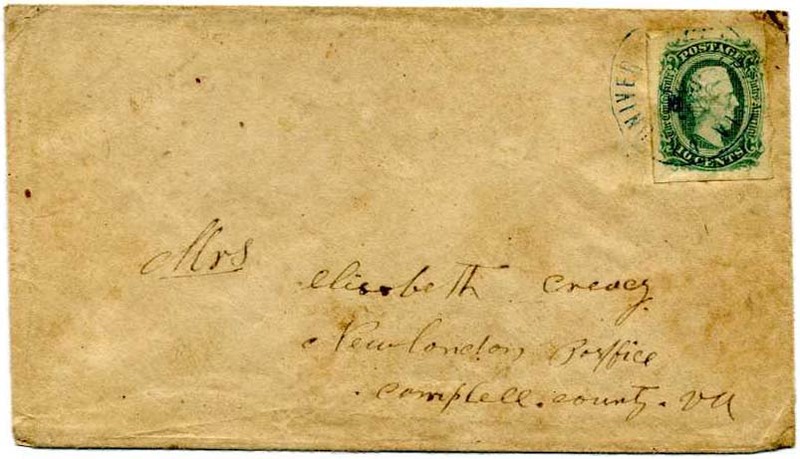 A perfect postal history project for someone with curiosity and tenacity. Ex Wayman. $150. CSA 11e, 10¢ blue OFFICIALLY PERFORATED, tied by indistinct town cds on lightly stained small cover to Miss R. V. Smith, Demopolis, Alabama, 1981 CSA certificate. SCV $900. $450. CSA 11c, 10¢ greenish blue tied pen strokes with cds of FRANKLINTON / NC cds and large penciled “Way” on TURNED COVER to J. H. Claiborne, Louisburg, NC, on the Tar River. 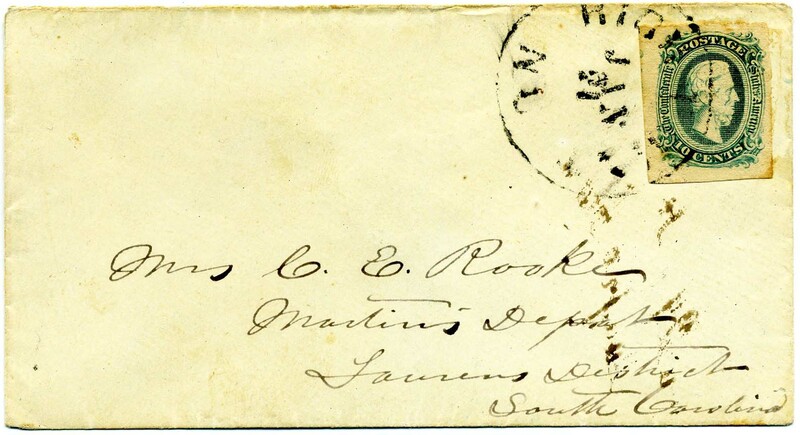 The letter was given to a post rider between post offices and marked Way in pencil at Franklin where the letter entered the Confederate mail system. 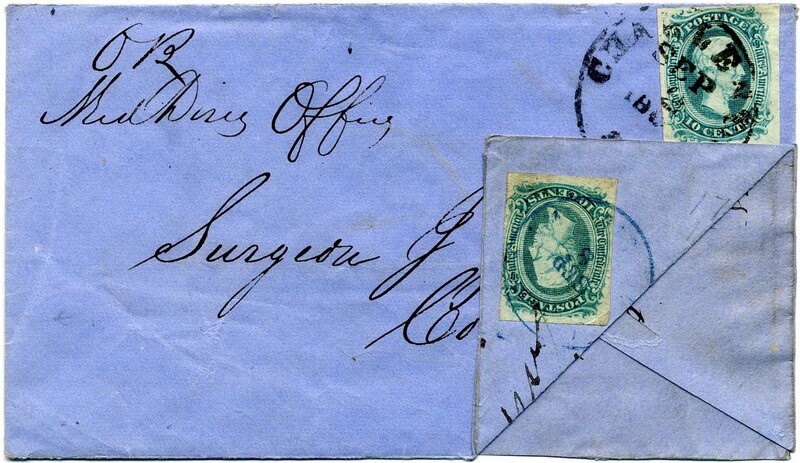 After delivery at Franklinton, the cover was turned and franked with a CSA 12, 10¢ blue to send a letter to Petersburg, Va. with RALEIGH / NC (about 26 miles from Franklinton), dcds to Senior Surgeon J. H. Claiborne. Slightly cut down at bottom and side flaps missing but Very Fine and showy FRANKLINTON WAY COVER. Listed in CSA Catalog with CV of $750. Ex Roth exhibit. $700. Surgeon John Herbert Claiborne was a Surgeon in the Field & Staff of Virginia 12th Infantry. He was detailed to Petersburg in charge of all Petersburg military hospitals. Much more information on linked page. CSA 11c, 10¢ bluish green with 4 large to huge margins showing part of adjacent stamp at top, tied pen with RED ABBEVILLE C.H. / S.C. cds on fresh cover to A. P. Calhoun Esq, Pendleton Village, So. Carolina. $125. Andrew Pickens Calhoun was the son of John Calhoun. Much more information on linked page. 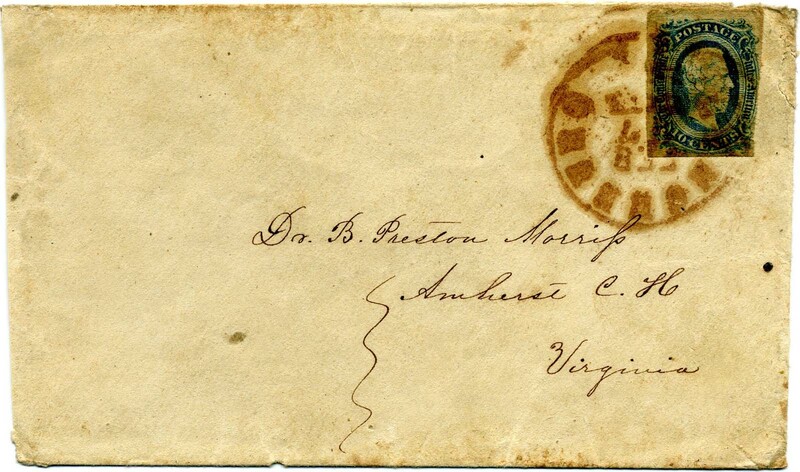 CSA 11-KB, 10¢ dark blue tied bold neat red-brown LYNCHBURG / VA // FEB / 17 cds on cover to Dr. B. Preston Morris, Amherst C.H., Virginia; slightly reduced at left. $250. 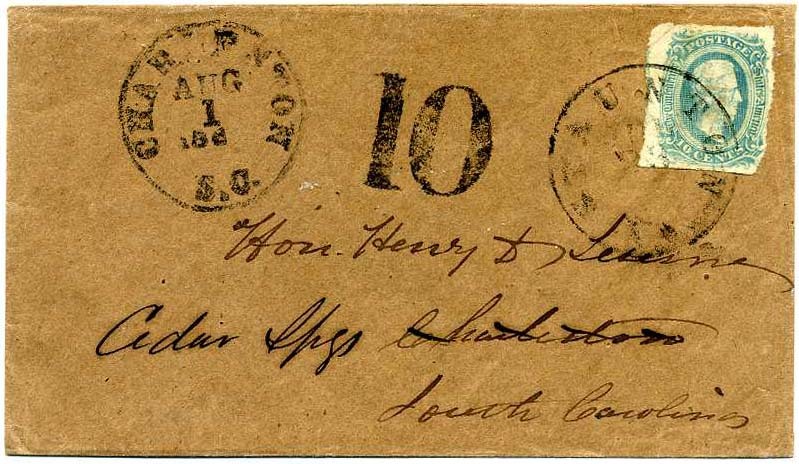 CSA 11, 10¢ blue tied CHARLESTON / S.C. // SEP / 2 cds on TURNED COVER TO “Surgeon J.H. Chisolm, Columbia, SC” with ms at top “O[fficial] B[usiness] Med[ical] Direc[tors] Office,” inside use CSA 11, 10¢ blue tied indistinct COLUMBIA / S.C. cds on cover to J.P. Hawkins, Southern Express Agent, Staunton, Va., then crossed out for whatever reason. Showy adversity cover with both medical and express connections. $450. Dr. John Julius Chisolm is considered one of the fathers of American Ophthalmology, among the first to surgically remove cataracts and to use cocaine in eye surgery. He had an illustrious career which is detailed on the linked page. 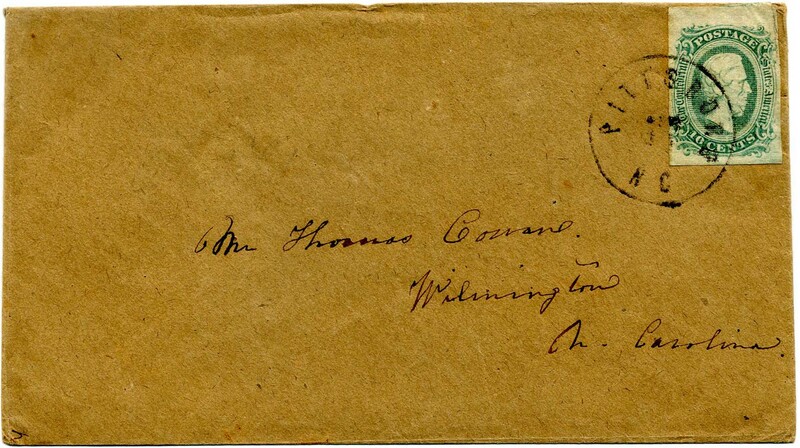 CSA 11c, 10¢ greenish blue top sheet margin (4 margins) tied neat PITTSBORO / N.C. cds on clean homemade cover to Thomas Cowan, Wilmington, N. Carolina. The Cowan family was well known. $110. 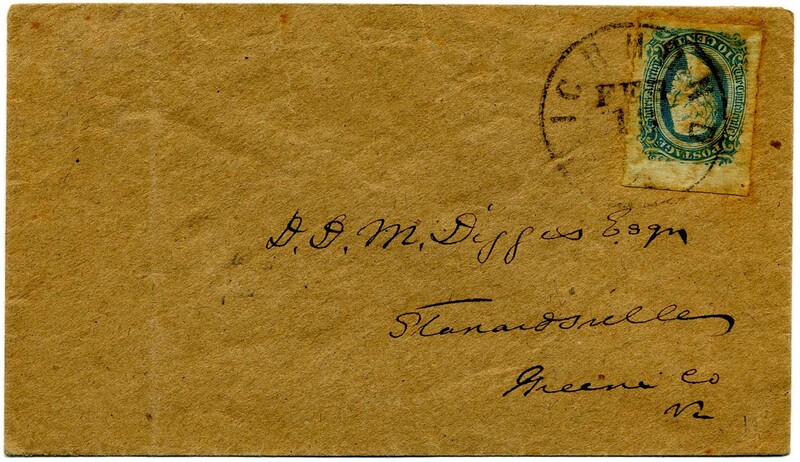 CSA 11, 10¢ blue top sheet margin (4 margins, gum stains) tied RICHMOND / VA. // FEB 13 on clean homemade cover to D. D. M. Digges Esq., Stanardsville, Greene Co, Va. Cover with file fold at left and stamp with tiny pinhole. $80. CSA 11, 10¢ blue (superb with 4 huge margins) tied ATLANTA / Ga. cds on clean homemade cover to Mess S. L. May & Co., Athens, Ga. $140. 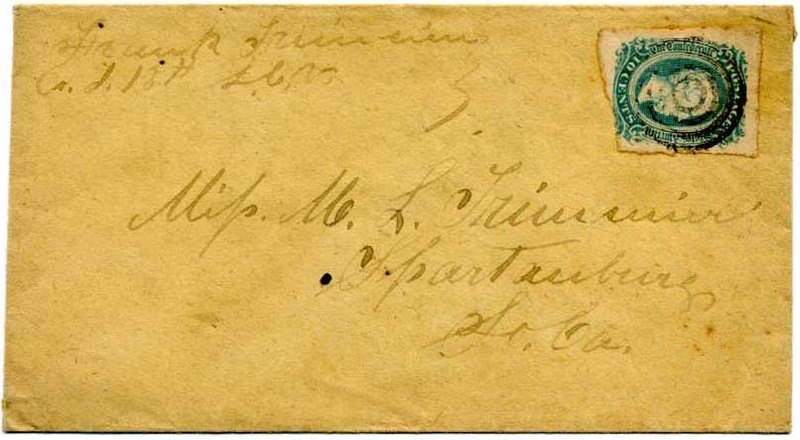 CSA 11c, 10¢ bluish green tied Army of Tennessee 7-bar 20 mm field grid, CSA catalog type ATN-04 (CCV $175) on cover “From W. J. Rhodes” to his wife “Mrs. Sallie A. Rhodes, Talladega PO Talladega Co, Alabama” with routing directive at lower left “Via Montgomery.” Slightly reduced at left. $150. Captain William J. Rhodes served in Company G, Thirty-first Alabama, and remained in the service until the close of the war. Much more information on linked page. 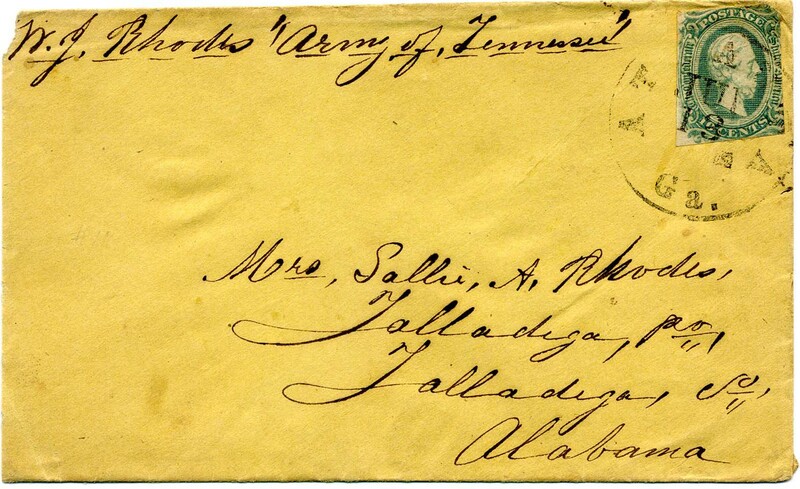 CSA 11c, 10¢ bluish green tied bold Army of Tennessee “Chattanooga Rover” postmark, dated January 18  CSA catalog type ATN-01, recorded only from Sept. 8, 1863-Jan. 23, 1864. On cover “From W. J. Rhodes, 31st Ala. Vols.” to his wife “Mrs. 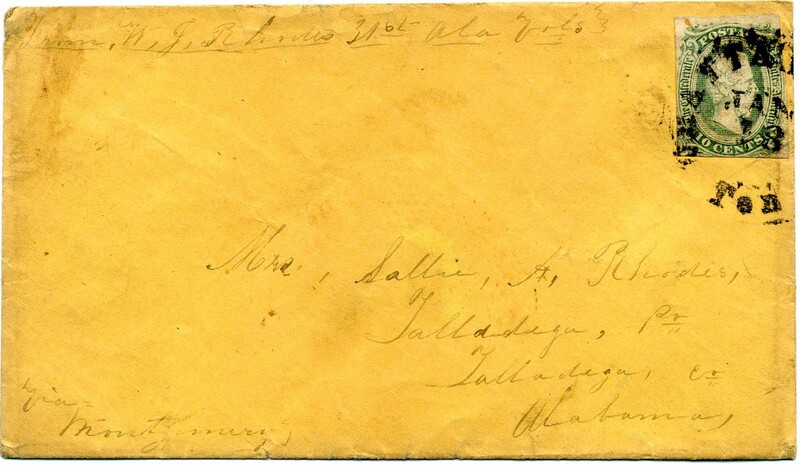 Sallie A. Rhodes, Talladega PO Talladega Co, Alabama” with routing directive at lower left “Via Montgomery.” $200. 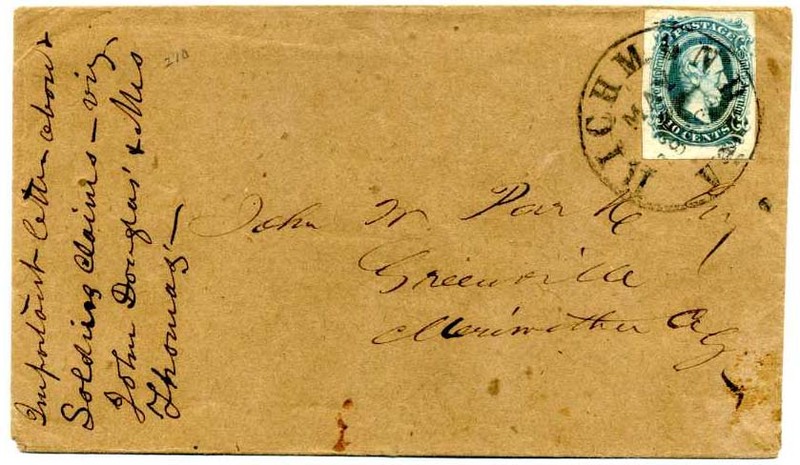 Chattanooga Army of Tennessee postmarks: Harvey T. Phillips, the former postmaster of Chattanooga, Tennessee, initially became the unofficial postmaster of the Army of Tennessee, on his own initiative, upon the evacuation of Chattanooga. Phillips initially used the “Chattanooga, Ten. 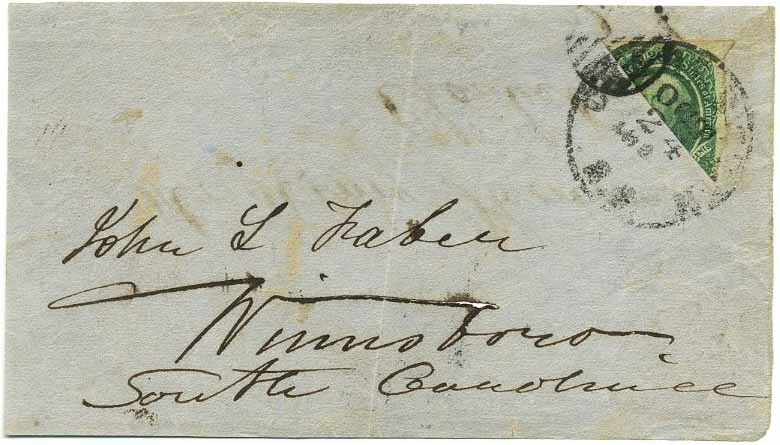 rover” postmark from September 8, 1863 to January 23, 1864. Captain William J. Rhodes served in Company G, Thirty-first Alabama, and remained in the service until the close of the war. Much more information on both the Chattanooga rover and Capt. Rhodes on the linked page. CSA 11c, 10¢ bluish green (slight crease at upper right) tied light ATLANTA / Ga. // JUL / 13 cds “From W. J. Rhodes, ‘Army of Tennessee” to his wife “Mrs. Sallie A. Rhodes, Talladega PO Talladega Co, Alabama.” Slightly reduced at left, her usual opening pattern. $150. 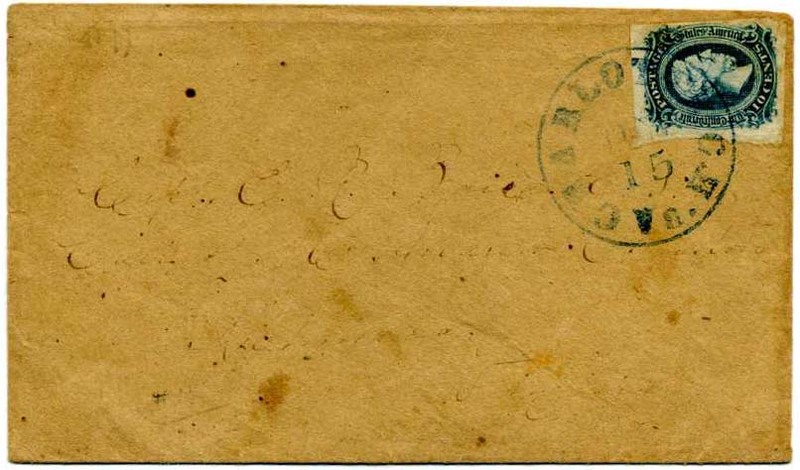 CSA 11e, 10¢ blue, OFFICIALLY PERFORATED, left sheet margin with straightedge at left, tied by MACON / MISS double-circle datestamp (some gum staining) on cover to H. D. Mahan, Marion Station, Lauderdale Co, Miss. 1976 PF certificate erroneously states this is Marion, Miss postmark. It is not. Marion canceling device differs significantly. Ex William A. Fox. SCV $900. $450. 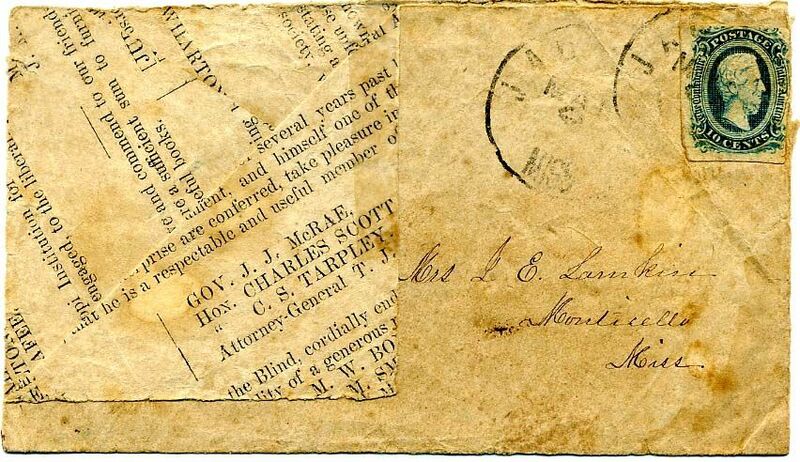 CSA 11, 10¢ blue, 4 huge margins all around, tied by sharp BENNETTSVILLE / S.C. // SEP / 3 cds on cover with "Official Business / Frank Manning" endorsement at top partly beneath stamp, addressed to Capt. J.E. Spears, Enrolling Officer, Georgetown S.C., Ex Kohn, Very Fine. $250. Captain J.E. Spears was in Co. B, 24th South Carolina, Longstreet's Army of Tennessee. Capt. Frank Manning was in Co. K, 8th S.C. Infantry, also Army of Tennessee. Henry Norgrove was a tailor and clothes merchant. He served in the Lexington Patrol during the war. Much more info on linked page. CSA 11-AD, 10¢ dark blue bottom imprint single showing Archer & Da[ly], tied by neat RICHMOND / Va. // MAY / 24 cds on legal size cover (8” x 3 ¾”) to Capt. Martin V. Moore AQM (Assistant Quarter Master) 65 N.C. Regt. Kinston, N.C. with ms. at top “Q.M. Gen’s Office/Official Business,” pencil docketing up left side “Confederate Memorials.” Slightly reduced at left, lightly cleaned and restored, still edge rumpling, ex Dr. Howard Green. $140. Martin Van Buren Moore served in Company D, NC 1st Cavalry, also Company E, NC 37th Infantry. He was promoted to Captain and Asst. Quartermaster in NC 7th Battalion Cavalry. Also saw service in Co. D, NC 9th Infantry and NC 6th Cavalry. Much more info on linked page. Harriott Middleton was the daughter of Henry A. Middleton, a wealthy planter. CSA 11, 10¢ light blue tied perfectly struck GOLDSBOROUGH / N.C. // JUL / 2 cds on fresh commercially made cover to High Shoals Iron Co., Iron Depot, N. Ca., Very Fine $230. High Shoals Iron Works was founded in about 1795. Fulenwider and did a lot of nail and rolling work for the Confederate government. Much more info on linked page. 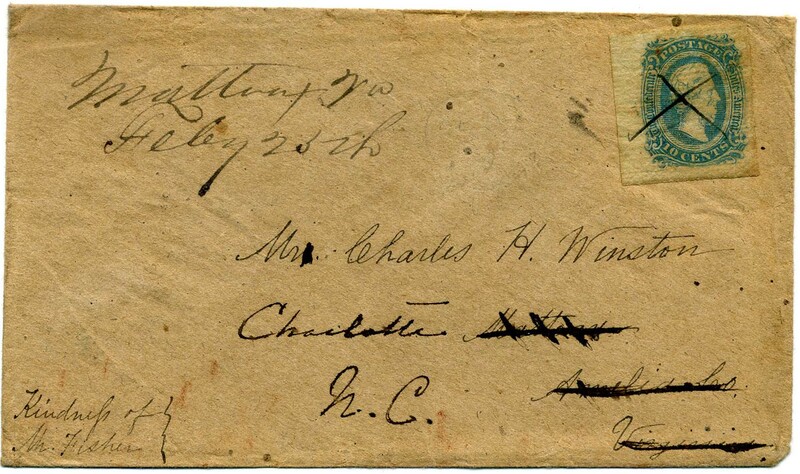 CSA 11, 10¢ greenish blue with 4 enormous even margins tied WILMINGTON / N.C. // SEP / 22 cds on back flaps of small commercially-made envelope to Miss Mary J. O’Hear, Charleston, SC Care E. Lafitte & Co. Edward Lafitte was a Charleston merchant. $125. CSA 11 (Archer & Daly) 10¢ blue left sheet margin with TEXTILE MARKINGS, used with manuscript Mattoax Va Feby 25th cancel used to FORWARD cover to Mr. Charles H. Winston, Charlotte N.C. Original use was hand-carried “Kindness of Mr. Fisher” to Mattoax Va. where subsequently redirected to Charlotte. Scarce stamp with TEXTILE MARKINGS, once erroneously thought to be “laid paper.” $250. 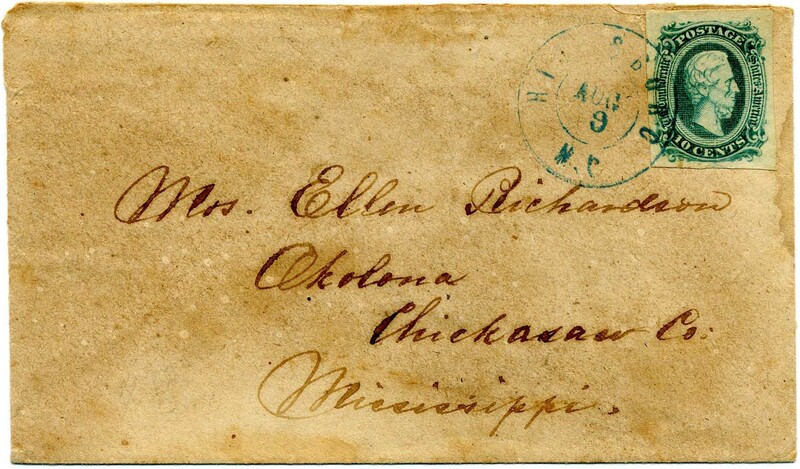 CSA 11 (Archer & Daly) 10¢ blue (4 margins) tied blue HILLSBORO / N.C. // AUG / 9 cds on cover to Mrs. Ellen Richardson, Okolona, Chickasaw County, Mississippi, back flap tear. SCV $130. $90. 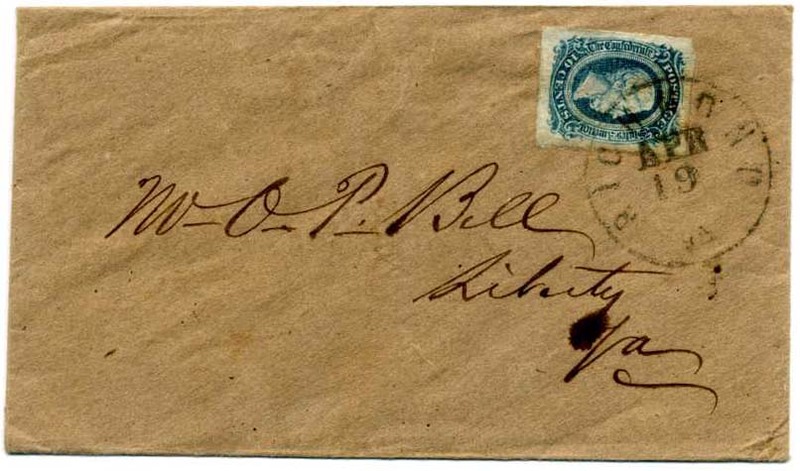 CSA 11 (Archer & Daly) 10¢ blue (4 margins) tied blue MORGANTOWN / N.C. // DEC / 29 cds on cover to William Rose, Care Cadet R. P. Howell, 62nd Ga. 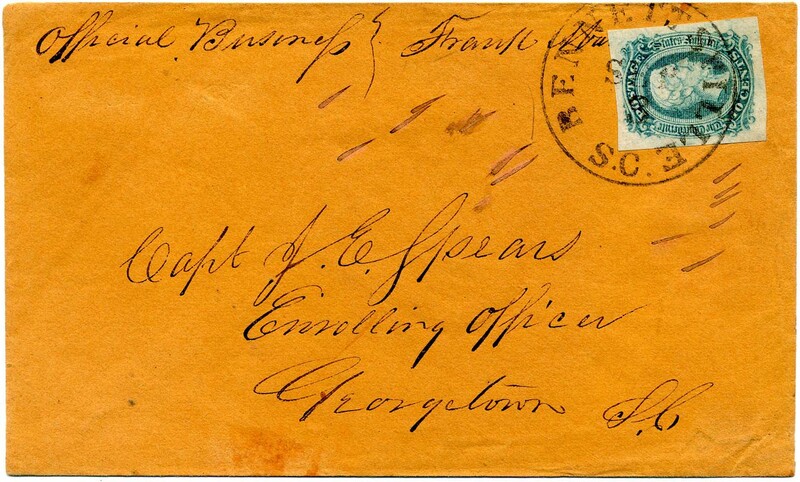 Regt., Franklin, Va. Small edge faults but nice military address and color postmark. $80. CSA 11 (Archer & Daly) 10¢ blue (4 margins) tied HIGH POINT / N.C. // JAN / 21 balloon cds on blue-lined envelope to Mrs. C. E. Rooke, Martins Depot, Laurens District, South Carolina, flap tears, Very Fine. $110. CSA 11 (Archer & Daly) 10¢ light blue (4 margins) tied GOLDSBOROUGH / N.C. // DEC / 8 cds, partially struck off cover, addressed to High Shoals Iron Co[mpany], Iron, N.C. with C & B & Co. at upper left. $110.